ABSTRACT: This article investigates the musico-poetic role played by the sentence in songs of George Gershwin, Jerome Kern, Frederick Loewe, Cole Porter, and Richard Rodgers. The phrase-type can be understood as an architectural frame for both composers and lyricists, fundamental to both musical and lyrical designs and crucial to the interaction between the two. 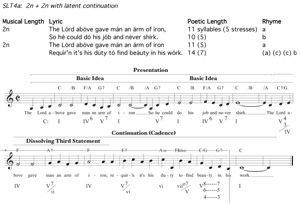 This study classifies lyrics that display sentential characteristics of repetition, intensification, and cadence and explores their correspondence to those features of musical sentences. The result is a more detailed picture of text-music relationships and phrase structure in the Great American Songbook. [1.1] Phrase structure in the songs of Tin Pan Alley and early and mid-twentieth century American musical theatre is, at least superficially, quite straightforward. Eight- and sixteen-measure phrases are the overwhelming norms, as are the AABA and ABAC forms that combine two or four of these phrases into whole songs, and the two- and four-measure sub-phrases that divide them evenly. (1) While some songs depart from these norms, and to great musico-poetic effect, composers and lyricists found room for a remarkably sensitive approach to phrase-type even within the boundaries of regular phrase lengths. (2) The apparent simplicity of this vocal genre conceals a striking complexity that lies at the intersection of two distinct meanings of phrase: a musical one, defined by harmonic progression, melodic design, and meter, and a lyrical one, rendered through rhymes, punctuation, line lengths, accents, thematic content, and overall narrative trajectory. (3) As I will demonstrate below, the interaction of words with music is particularly nuanced in sentential phrases because the repetition, intensification, and cadence of a musical sentence can be exhibited compellingly by lyrical factors on their own. A phrase can be dually sentential, or either words or music can emphasize, compensate for, or even contradict the other. This article disentangles the seeming musical regularity of sentential phrases from their far more challenging musico-poetic features, thereby elucidating the full potential of this one phrase-type within the Great American Songbook. [1.2] Before classifying the interactions of musical sentences with lyrical sentences, I will establish a methodology for identifying each of the two types independently. Musically, a sentential phrase must meet three criteria, all of which are exemplified by the 8-measure A section of Richard Rodgers and Lorenz Hart's “You Took Advantage of Me” (Example 1). (4) First, it must begin with a presentation of at least, and almost always exactly, two basic ideas, which is normally but not necessarily tonic-prolongational. (5) For simplicity, I will use n to refer to the musical duration of one basic idea; thus, a typically proportioned presentation, continuation, and entire sentential phrase are 2n, 2n, and 4n in length, respectively. Secondly, the continuation must do something to exceed the n + n repetition of the presentation and build momentum toward a cadence, most typically through acceleration of harmonic or surface rhythm, fragmentation into a proportion such as ½ n + ½ n + n, a harmonic progression away from tonic, or even just an unbroken tonal and/or melodic unit of length 2n. (6) Finally, the phrase must conclude with a half or authentic cadence, inclusive of stylistic norms such as tonic chords with added sixths and half cadences on altered or extended dominants. [1.4] In this particular lyric, poetic meter also contributes to an acceleration across the entire stanza. Each line ends with an accented syllable—the first two lines because of the omitted last syllable of trochaic pentameter, and the third through fifth lines naturally due to their iambic and anapestic organizations. But the changes in poetic meter create a progression from zero poetic anacruses (lines 1–2), to one anacrusis (lines 3–4), to two (line 5), requiring the delivery of each line to begin earlier than the last with respect to its first accented syllable. Since each line ends accented, one must hasten progressively to say the increasing number of syllables that follow, an intensification that is mirrored exactly by the music as sub-phrases begin on the downbeat (measures 1 and 3), then with a quarter-note anacrusis (before measure 5 and before measure 6), and finally with two eighth-note ones (before measure 7). When the sentential features of music and lyric are straightforwardly in lock step as they are here, it is difficult to extricate the effect of one parameter from that of the other; the sentence is dually articulated. [1.5] This study shares several of the motivations of work by Harald Krebs (2013) and Stephen Rodgers (forthcoming) on musico-poetic sentences in Schumann’s Lieder and in Schubert's Die schöne Müllerin, respectively. Both authors argue, as I do, that aspects of poetic structure and semantic content can suggest and correspond specifically to certain features of musical sentences and, furthermore, that the form can play an important role in text expression. Rodgers compellingly positions the phrase-type at the heart of Schubert's storytelling, drawing parallels between types of poetic repetition and sentential presentations, between compressed and lengthened continuations and their textual motivations, and even between disproportionately long presentations and the 'manic' states of mind that they capture. Krebs shows, in normative sentences, how either the musical continuation or the corresponding part of the poem can be manipulated to correspond more closely to the other, and in more problematic cases, how a poignant effect can be created by a departure from sentential norms. Rodgers and Krebs, however, do not categorize types of sententially suggestive poetic designs. Doing so for the lyrics of the Great American Songbook is the central focus of this article. [1.6] Studies of lyrics in the songs of Tin Pan Alley and American musical theater, including discussions by composers and lyricists themselves, agree on the importance of distinguishing lyrics from poems as, among other things, far more essentially dependent upon their music. (11) Poetry (such as the texts of Lieder) usually exists prior to any musical setting and is written to be spoken, read, and reread on its own; a poem is subsequently accommodated by a composer into a musical setting that communicates, interprets, and perhaps alters its meaning. (12) In contrast, lyrics are inherently musical and, moreover, were often added to music that was still being written, or even that already had been written in its entirety. (13) The result is an interdependent relationship in which the words and the music set each other; they equally and often inseparably co-determine phrase structure, which is, at its essence, a hybrid construct. (14) Therefore, neither component can be understood fully except in musico-poetic terms. [1.7] The sentence is not the only common phrase-type in the genre, but it is a uniquely fertile musico-poetic nexus. The proportions and energies of the sentence (i.e., repetition, intensification, and conclusion) can be brought about independently by the sonic and semantic characteristics of a lyric or by the melodic and harmonic design of a musical phrase. Lyrics that display sentential features are inherently musical not just in a generic sense (because they were written to be sung), but also in strikingly specific ways that correspond to what we already understand about musical sentences. These correspondences permit a remarkable range of word-music interactions ranging from unanimously sentential music and words that reinforce each other, to decidedly sentential lyrics that compensate for or make manifest less strongly or more latently sentential music (or vice versa), to seemingly contradictory phrases in which one element is sentential in spite of the other not being so. Thus, it is not just the frequency of sentential phrases, but also their musico-poetic complexity that necessitates examining the poetic structure and thematic content of Great American Songbook lyrics in terms of this musical form. (15) I consider lyrics with the help of, and indeed as instances of, the sentential structures that have been defined in musical terms. I imagine that the sentence as defined above was, either consciously or subconsciously, one of the primary architectural templates for both the lyricist and the composer. Its goal-directedness and forward drive are equally well suited to crafting a compelling lyric and writing a catchy tune—and, beyond this, crucial to the expression that lies at the intersection of music and words. [2.1] To account for the musico-poetic sentence of the Great American Songbook, we must define Sentential Lyric-Types as precisely as we do presentations, continuations, and cadences in the purely musical version of the phrase-type. My intent is to classify a set of sentential norms and options for this repertoire in general rather than in the songs of any one specific composer, lyricist, or time period. I rely upon a corpus of 207 songs composed between 1905 and 1973 in the distribution shown in Figure 1. The songs are drawn almost equally from the work of five representative composers, four of whom worked in collaboration with the same one or two lyricists throughout the corpus: Cole Porter on his own, Richard Rodgers with Lorenz Hart and then Oscar Hammerstein II, George Gershwin with his brother Ira, and Frederick Loewe with Alan Jay Lerner. (16) 111 of the 207 songs contain at least one phrase that meets the three criteria of a musical sentence discussed above. 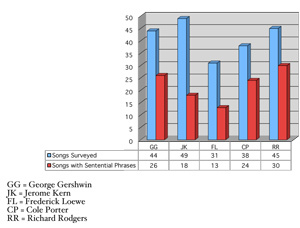 Sentences are most common in the music of Rodgers (67%) and Porter (63%), and least common in the songs of Kern (37%) and Loewe (42%), with Gershwin (59%) in between. [2.2] The lyrics of the sentential phrases cluster around four common Lyric-Types, which are not all sentential in the same way, or even to the same extent. The vast majority of sentences occur within the sectional refrain of a song (e.g., the main body of the song in AABA or ABAC form), rather than within the oft-forgotten sectional verse that precedes it, and they occupy just one phrase (e.g., one A section of a 32-bar AABA);(17) thus, a Lyric-Type describes part, not all, of a song’s lyric. 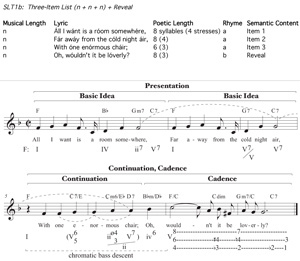 Schematic diagrams of the four SLTs (Sentential Lyric Types) appear in Figure 2. (18) Semantic layout is more important than poetic structure in the definitions of these types, so the first two SLTs are characterized by the sentential shapes of their overall narrative trajectories; the last two, which lack these storytelling arcs, are defined only by their basic proportions. While poetic meter, rhyme scheme, and exact line length contribute significantly to the sentential quality of particular lyrics and to the word-music interactions in those songs, these three elements of poetic structure do not factor into the essential definitions of the four SLTs because they are highly variable within each type. [2.3] The four types capture how a phrase can be sentential lyrically, so they overlap inexactly with recent taxonomic approaches to the musical characteristics of sentences. In the SLTs as well as in purely musical terms, the sentence is a plural form with sub-types that interact variously with the prototypical short-short-long proportion and express different relationships of similarity, contrast, and segmentation. More analytical attention has been paid to types of sentential continuations, which are typically more complex than presentations. (19) Two issues are of particular interest: whether a continuation is an outgrowth and intensification of the presentation or a departure from it, and the extent of separation between continuation and cadential functions in the second half of a sentential phrase. BaileyShea’s (2004) sentential taxonomy is organized according to a spectrum of differentiation between presentation and continuation. In a sentence with “dissolving third statement,” the continuation begins as an additional statement of the basic idea, but then departs from it. An AABA sentence features a much clearer melodic contrast at the start of the continuation, and a sentence with nested sentential continuation occupies a middle territory, since it typically fragments the opening motivic material without actually beginning as a third statement of it. Richards (2011) fine-tunes the relationship between continuation and cadence by elaborating on Caplin’s (1998, 47) notion of a fused continuation ⇒ cadential function. Richards distinguishes among three relationships between continuation and cadential functions: “Continuation (Cadence),” in which the latter is embedded within the former, “Continuation/Cadence,” in which the former consists entirely of the latter, and “Continuation, Cadence,” in which the two are distinct functions. This distinction becomes particularly useful when words enter the mix, so I adopt Richards’s three categories in annotating each musical example. [2.6] Lacking the inherently sentential narrative arcs of the first two types, SLT3 is defined simply by its short-short-long proportion (i.e., n + n + 2n). Two neatly separated lines of text in the first half of the lyric, which usually rhyme, contrast with a second half in which either an enjambment, a lack of rhymes, or some other linguistic factor prevents the same kind of subdivision. SLT4, although its 2n + 2n proportion is symmetric and not necessarily suggestive of a sentence on its own, is classified as a sentential lyric-type because it accounts for the lyrics of 20 percent of sentential phrases in the corpus. Latently sentential features of lyrics in this type are often made manifest by more overtly sentential music. [2.7] Sentential lyrics are unified throughout the genre around these four basic designs, and moreover, each lyric-type is capable of interweaving with musical sentences in remarkably subtle ways. This richness holds true even in 8- and 16-measure sentences that, considered without their lyrics, would be musically straightforward. The next four sections of this article discuss representative examples of each of the Sentential Lyric-Types and their common sub-types. Following this, the remaining sections explore songs in which SLTs are blended together, expanded such that an entire song functions as a single SLT, and altered to great expressive effect. A thorough account of this ubiquitous phrase-type permits a fuller understanding of the whole range of mutual influence between words and music in the Great American Songbook. [3.1] The most prevalent Sentential Lyric-Type in the corpus is the List + Reveal; this accounts for the lyrics of 35 percent of the musically sentential phrases. The Fragmented List + Reveal sub-type (SLT1a), to which “You Took Advantage of Me” (Example 1) belongs, is more overtly sentential than any of the others because both the proportions and the content of its second half suggest continuation function. The third and fourth list items are each fragmented to half the lengths of the first two, but these last two list items typically intensify the lyrical sentiment as well. They often usher in a change of address (e.g., “You’ve”), or else shift from the expository statements of the first two list items to their effects in the third and fourth ones. (27) The Richard Rodgers phrase (Example 1), for example, aligns closely with both of these lyrically sentential factors: the motivic material from measure 2 of the basic idea is fragmented in measures 5–6 to a proportion of ½ n + ½ n, creating a nested sentential proportion (½ n + ½ n + n) across measures 5–8 that is effected musically and lyrically with equal strength. Simultaneously, the harmonic stasis of the presentation (i.e., tonic to dominant within each basic idea) gives way to a harmonic departure—here, a tonicization of a pre-dominant harmony—which, through the introduction of modal mixture, creates further tonal demand for the upcoming cadence that parallels the demand for lyrical resolution in the upcoming reveal. The sense of musico-poetic closure in measures 7–8 thus derives equally from the synchronized effects of the lyrical punchline, “’Cause you took advantage of me,” and the perfect authentic cadence. [3.2] The element of fragmentation is missing from the Three-Item List + Reveal (SLT1b) because the reveal is preceded by three list items of equal length (i.e., n + n + n). Absent any inherent acceleration within the 3n total duration of the list, SLT1b lyrics such as Ira Gershwin’s “They Can’t Take That Away From Me” (Example 2) build momentum solely through the content of list items. (28) It would be overstating to claim that the Gershwin lyric is unequivocally sentential, for its abab rhyme scheme alone might suggest a quasi-periodic division of the lyric into two ab halves: “hat” and “tea,” “that” and “me.” However, words and music compensate for one another, creating a musico-poetic phrase more strongly sentential than either element would be in isolation. [3.3] The first two list items, which do not rhyme, nonetheless form a coherent lyrical presentation because each names a mannerism of the beloved: how she wears her hat, and how she sips her tea. The consistent iambic trimeter and the repeated phrase, “The way you,” also help to substitute for the lack of end rhyme. (29) Musically, the n + n presentation consists of two basic ideas that mirror each other both melodically and tonally. “The way you wear your hat” ascends and moves from dominant to tonic, then “The way you sip your tea” falls and returns from tonic to dominant. (30) The rhythmic declamation is also parallel, placing the three accents of each poetic line on beat 2, on beat 3, and just before beat 1; this establishes, in Yonatan Malin’s terminology, a consistent declamatory schema of [ - 2 3 - a]. (31) The third line begins as a mere addition to the list, maintaining the poetic meter, length, and declamatory schema predicted by the first two lines; semantically, though, it both broadens the scope of the lyric from individual traits to a holistic “all that” and shifts the perspective from assumed adoration of a present lover to nostalgia for a former one. The interjection, “No, no!”, heightens the expectation for the negative statement that is now bound to appear in the reveal, which clarifies that the three ambiguous noun clauses of lines 1–3 are objects, not subjects, and that “that”—a referent that is perfectly set up by the “all that” in line three—is not to be taken away. [3.4] Without the fragmentation provided by the shortened third and fourth list items of a Fragmented List + Reveal, the musical setting of a Three-Item List + Reveal often forgoes fragmentation in its continuation as well. Given that the third line of the lyric continues the ongoing list while also initiating an intensification toward the reveal, the best musical match is a sentence with dissolving third statement (after BaileyShea 2004), which is apt because it connects the third list item melodically to the first two while still initiating an increase in tonal momentum sufficient for sentential continuation. During the third list item, “the mem’ry of all that,” the preceding high point G4 is exceeded by B 4 over an applied dominant of IV, sustaining through the interjected “No, no!” (on the yet higher C5) and resolving on the metrically accented “can’t” of the last lyrical line. A tonal bond is thereby forged between the third list item and the reveal, which bolsters the lyrical bond; while the lyric on its own is supportive of a sentence, it relies on the tonal charge of the applied V7 of IV to ratchet up the lyrical expectation of a reveal across measures 5–7. [3.5] Aside from the relationship of semantic content to musical phrasing, line length and poetic meter in this lyric also interact richly with hypermeter. The 8-measure phrase is offset hypermetrically by one measure, beginning in the eighth bar of a hypermeasure and finishing at the end of the seventh. (A double bar line after the first measure of Example 2 indicates the beginning of an eight-bar hypermeasure, and the first measure thereafter is “measure 1” in my numbering.) The iambic trimeter of the first three lyrical lines makes each of them end- rather than beginning-accented, and the consistent declamatory schema of [- 2 3 - a] positions these lines metrically as measure-long anacruses to the first, second, and third of four two-bar hyperbeats in the 8-bar hypermeasure. The lyric’s rhyme scheme (“hat,” “tea,” “that”) thus unfolds at these hypermetrical waypoints (each anticipated stylistically by half a beat); their metrical strength lends even greater emphasis to words that are already accented by the poetic meter. If the potential for periodicity were to be realized fully, then line 4 of the lyric would follow the same declamatory schema, allowing a rhyme with “tea” to fall neatly into place on the last half beat of measure 6. The same schema, [- 2 3 - a], is initially supported by measure 6 if one hears both “No”s, on beats 2 and 3, as accented syllables; this is alluring because such a halting, emphatic delivery of the two words heightens the contrary nature of the interjection. However, the schema is disrupted precisely when the lyric’s semantic trajectory is as well, when “can’t” arrives an eighth note later than the schema would predict, on the downbeat of measure 7. Moreover, “can’t” fails to complete the lyric’s abab rhyme scheme, on top of which no musical cadence has been reached. Thus, a huge sentential acceleration is forced to occur within the span of a single measure: lyrically, by the need to secure an “-ee” rhyme; rhythmically, by the need to accommodate those additional lyrics, which have caused line 4 to swell to six stresses (double the number of each previous line); and harmonically, by the need to reach a cadence. [3.6] Lengthening the musical setting of line 4 to include the sixth, seventh, and eighth measures of the hypermeasure would be unsuitable since, as Alec Wilder points out (1972, 157), the next A section starts with the same full-measure anacrusis as this one does and the singer needs room to breathe. The extra syllables cannot be pushed earlier either, since it would thwart the dramatic effect of “No, no!” to place anything but the contrary “can’t” on the downbeat of measure 7. The only possibility is a rapid-fire delivery of the last eight syllables within one measure, barely managing to squeeze the rhyming “me” into the last half-beat of measure 7 (and only on a weakly cadential V7 of V, relying on the dominant anacrusis to the second A section for its resolution). The three additional iambs of the now-expanded line 4—“take that,” “away,” and “from me”—are also precisely enough to reprise the [- 2 3 - a] declamatory schema that has pervaded the phrase, but now in the opposite hypermetrical position, occurring within a strong bar rather than within a weak one. 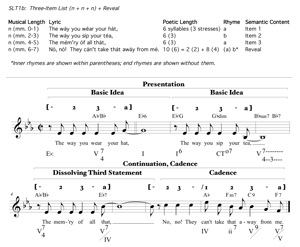 The crowded line 4 cannot afford the rhythmically empty measure that followed each of lines 1-3, so measure 7 is able to take advantage of the dual occurrence of “that”: it answers the four-measure “hat”/“tea” rhyme (lines 1-2) not only with a corresponding four-measure “that”/“me” rhyme (taking the “that” of line 3), but also with a greatly compressed version of the same rhyme within the last measure of the phrase (taking the “that” of line 4). Tonal, semantic, and especially rhythmic and metrical factors conspire in the last two measures of this phrase to render a musico-poetic sentence far more resolute than either a musical or a lyrical one would be on its own. [3.8] How long should this cadential progression be, though? The revelatory line that follows an n + n list does not typically contain twice as many syllables as each list item, and Hammerstein’s reveal is in fact slightly shorter than each of his two list items (i.e., 8 rather than 9 syllables). (36) This may seem to suggest, lyrically, a musical setting of total length 3n (e.g., 6 or 12 measures), with two basic ideas followed by a half-normative continuation of length n. Such happens in blues-derived songs (e.g., Cole Porter’s “Friendship”), but the most frequent compromise in a musical phrase of typical length 4n is for the cadential arrival to occur at the very start of the last n (e.g., on the downbeat of measure 7 in an 8-measure phrase such as Kern’s). The first seven syllables of the reveal occupy the same amount of music as each 9-syllable list item, and then just a sustained “mine” is required to occupy the last n and reach the normative phrase length. [3.9] However, the predominance of 8-measure phrases is an unsatisfactory explanation for why the shortest line of text lasts twice as long as either of the other two, for it would miss the point to say that a lyric of inherent length 3n is stretched into a phrase of actual length 4n. A more than superficial glance at the poetic structure reveals that Hammerstein’s lyric embeds a latent potential for exactly Kern’s musical phrase structure: 3n + one long syllable = 4n. Lines 1 and 2 scan identically; they are irregular, but each has four accented syllables. Given that n equals two measures, ¼ n equals two beats, so the eight poetic accents in lines 1–2 align exactly with each half-note pulse of measures 1–4 (i.e., beats 1 and 3 of each measure). The exact correspondence of accented syllables to half-note units continues, but Kern’s music reads line 3 as containing five rather than four accents (i.e., “Can’t,” “help,” “lov-,” “man,” and “mine”). The extra accent on “help,” which is not obvious when reading the lyric alone, pushes the final word “mine” to the downbeat of measure 7. Even though line 3 contains fewer total syllables than each of the first two lines, its latent extra accent is made manifest by Kern’s musical scansion. [3.11] “You’re the Top” (Example 5) is a masterpiece in the same procedure. The compliments at the start of each stanza liken “you” to things and people with great stature, such as “the Colosseum,” “the Nile,” and “Mahatma Ghandi,” but the stanzas finish by setting up items to rhyme with pop-culture crazes, making comparisons that often border on the absurd (e.g., Mickey Mouse, camembert, Ovaltine, cellophane). The witty content of these playful likenings is itself climactic, as the listener learns to predict these most outlandish end-rhymes; it is all the more so on account of the assistance provided by the poetic structure. The surface rhythm of the music is forced to accelerate by the increasing number of syllables in each four-measure line of the lyrics, from 9 syllables in lines 1–2 to 12 and then 15 in lines 3–4. (38) The accelerations in the poetic rhyme scheme motivate a corresponding fragmentation of ‘rhymed’ musical motives. The spacious, double end-rhyme of “Colosseum” and “Museum” compresses in line 3 to an inner assonance between “melody” and “symphony.” Although line 4 rhymes with line 3 and features the same nested proportion (though now with a full rhyme between “bonnet” and “sonnet”), the three punctuation marks in line 4 manage to suggest further fragmentation by dividing it into three clauses as opposed to the single one of line 3, assisted by the musical liquidation to repetitions of a single pitch (D5). The return of “You’re” at the end of the lyric sets apart the climactically absurd likening, “You’re Mickey Mouse,” with both content and poetic structure adding a sense of lyrical cadence even in the absence of a reveal. [3.13] The continuational role of measures 5–6 is clear—the acceleration in harmonic rhythm and the single melodic trajectory across the last 2n—but the same two measures simultaneously portray line 3 as also part of an ongoing lyrical list, and with great subtlety. In spite of its different length and meter, line 3 links clearly to lines 1–2 through end-rhyme, which Loewe’s music emphasizes through the melodic middleground of the phrase. In measures 1–4, a straightforward declamatory schema of [1 - 3 - / 1 - 3 - ] (after Malin 2010) emphasizes, through declamation, the rhyme between the ends of the first two lines (“-where” and “air”), since these syllables are metrically parallel on beat 3 of measures 2 and 4. Melodically, the same two syllables also establish the beginning of a longer-range stepwise ascent from F4 to G4. The rest on the downbeat of measure 5 accommodates the one fewer accent in line 3, making the trimeter declamatory schema of [- - 3 - / 1 - 2] as parallel as it can be to the tetrameter schema of measures 1–4. The result is that “chair,” the rhyming end of line 3, arrives at just the right pitch (A4) and metrical location (measure 6, beat 3) to continue the <F–G–A> ascent and thereby create a musical ‘rhyme’ in support of the linguistic one. This longer-range <F–G–A> replicates the more local <F–G–A> ascents within each of the three list items (measure 1, measure 3, and measures 5–6). Thus, the B –C that immediately follows on “Oh, would-” is dually conclusive, since it continues both the local and the middleground stepwise ascents from F, accelerating the local one by removing the repetitions on each pitch and greatly accelerating the middleground one by ascending every beat rather than every eight beats. [3.14] A combination of lyrical and melodic connections both at and beneath the surface serves to conflate the role of measures 5–6, which act both as continuational propulsion toward the cadential reveal in measures 7–8 (i.e., as the initiation of a 4-measure melodic and tonal motion), and as a somewhat altered extension of the presentational list ongoing since measure 1. The role of this third quarter of the phrase—particularly its various relationships backward and/or forward—is especially complex in sentences with text owing to the capacity of musico-poetic factors to solder the connections both to what precedes it and to what follows it. [4.1] The second Sentential Lyric-Type (SLT2) bookends its content by beginning and ending with the same central idea. SLT2 describes 16 percent of the sentences in the corpus, and it is exemplified by Cole Porter’s “Blow, Gabriel, Blow” (Example 7). The type begins with two lines of length n—first the title or main idea, and then either a repetition as in the Porter lyric or a paraphrase (usually rhyming). Rather than creating and then fulfilling the need for a climactic statement as in a List + Reveal, a Bookended lyric returns to the opening statement after it is recontextualized or elaborated during the third n of the phrase. The thrice repeated title can, as in the Porter lyric, be made somewhat more tasteful through rewordings such as “go on and...” and “so,” which also compel anacruses that add some energy to the surface rhythm of subsequent lyrical repetitions. [4.2] Like the Fragmented List + Reveal (SLT1a), Bookended lyrics often include fragmentation after the halfway point via shorter lines of text that rhyme independently of the first two. In Porter’s lyric, the rhyme of “scamp” and “lamp” divides the third n into ½ n + ½ n (shown as lines 3–4), and the independent clauses “I was a sinner” and “I was a scamp” hint at even a further fragmentation of line 3 into lyrical units of ¼ n. This lyrical fragmentation is especially common, and perhaps even obligatory, in the Bookended type, since the third n is the only opportunity to build momentum and to provide relief from an otherwise highly redundant text. In Porter’s lyric, the story of Reno Sweeney’s atonement and reformation needs to be told during lines 3–4, since only the motto appears elsewhere; the short clauses and rapid rhymes rush to clarify and expand upon the song’s title. [4.3] Likewise, measures 9–12 of the 16-bar phrase must build sufficient momentum to compensate for the static repetitions elsewhere. While measures 13–16 manage to finish on tonic rather than turning around as measures 4 and 8 do, they do so weakly, plagally, and without melodic, registral, or rhythmic factors to set them apart from measures 1–8 as climactic. Thus, aside from the hypermetrical expectation that is fulfilled by a 16-measure phrase, it is primarily the increased energy of measures 9–12 that imbues the terminal repetition of the opening melody in measures 13–16 with cadential status. The diminution of the <B 4–C5–G4> (from measures 1–2) in measures 9–10, the intensification of syncopations from the quarter-note level to the eighth-note level, and the complete octave descent from B 4 to B 3 all build energy and set up the return. This musical recasting of the final four measures parallels, and contributes to, the added rhetorical weight bestowed upon the final motto in line 5 by the lyrical intensification in lines 3–4. [4.4] It is true of sentences in general that the continuation increases the energy level of the phrase in some way, often through motivic fragmentation or acceleration of surface or harmonic rhythm. 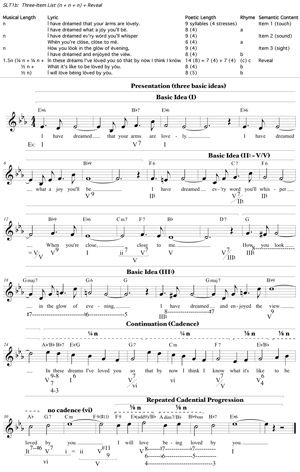 Considered without lyrics, the musical sentences in “You Took Advantage of Me” (Example 1) and “Blow, Gabriel, Blow” (Example 7) introduce these elements at the same time, during the third n, but the musico-poetic effects of these intensifications are different. 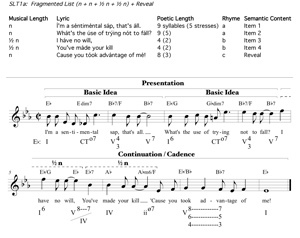 In the Rodgers and Hart song (Fragmented List + Reveal), the attainment of a tonicized pre-dominant harmony during the third n, on “I have no will, you’ve made your kill,” along with the introduction of modal mixture, heightens the demand for cadential resolution just as the increase in lyrical intensity demands a narrative punchline. The dramatic effect is comparable to what one experiences at the asterisk in the following sentence: “Whether by land, by air, or even by sea,* we deliver.” In “Blow, Gabriel, Blow” (Bookended), a similar process of fragmentation acts differently, creating additional activity to render the return of an already familiar line as confirmational rather than expository. (40) The effect is now closer to that at the following asterisk: “You are the one; I know that you are. I’ve searched high and low, far and near, and* you are the only one for me.” It is not just that the two lyric-types match or are frequently set by correspondingly distinct musical sentence types; beyond this, the fundamentally different narrative arches of SLT1 and SLT2 lend specific musico-poetic voice to the musical devices that make instrumental sentences so diverse and problematic in the first place. Example 8. From Jerome Kern and Anne Caldwell, “Ka-lu-a” (lyrics only). [4.5] Sentential Lyric-Types capture the most common lyrical organizations of sentences in the Great American Songbook, but they are neither exhaustive nor entirely mutually exclusive. Even though the List + Reveal and Bookended types describe distinct semantic paths, it is possible for a lyric to display aspects of each type. Jerome Kern and Anne Caldwell’s lyric to “Ka-lu-a” (Example 8) features the fragmentation that characterizes both SLT1a and most instances of SLT2 (i.e., n + n + ½ n + ½ n + n), but it is not fully captured by either the bookended circularity of SLT2 or the climactic end-reveal of SLT1. The hybrid nature of the lyric begins immediately in lines 1 and 2, which suggest bookending by repeating the name of the titular place, “Kalua,” and simultaneously initiate a list of its charms (i.e., “night like this is divine” and “when your kisses met mine”). The two lines rhyme and scan identically before and after their commas, so both aspects of their bifurcated semantic role—the title before the commas (SLT2) and the list items after them (SLT1)—are strengthened by poetic factors. [5.1] Lyrics that lack the consistent narrative trajectories captured by the List + Reveal and Bookended types cluster around two other types that are defined instead by their proportions. The first of these, and the last SLT that is inherently sentential, is the n + n + 2n, which accounts for 18 percent of the sentences in the corpus. It is the lyrical version of the prototypically sentential short-short-long proportion: two neatly separated lines in the first half of the lyric (n + n), which often rhyme, followed by a contrasting second half (2n) fused together by aspects of the poetic structure that prevent another n + n subdivision. I divide n + n + 2n lyrics into two sub-types based upon the clarity with which the final 2n coheres as a single unit. The second half of an SLT3a lyric is unequivocally indivisible. In contrast, the third quarter of an SLT3b lyric presents itself initially as a third n-length module, but its unexpected enjambment with the final line of text causes a retrospective reinterpretation of the third n-length unit as actually just the first half of a larger 2n span: n + n + (n + n)→2n. [5.2] Hammerstein and Harbach’s lyric to “Sunny” (Example 9) is a characteristic instance of the immediately evident n + n + 2n (SLT3a). The separation of the n + n lyrical presentation is made clear by the two complete sentences (in the traditional linguistic sense), each ending with the reiterated “Sunny,” and by the rhyme between the immediately preceding words, “hair” and “there.” Jerome Kern’s presentation makes a big deal of the repeated word, “Sunny,” setting it each time with a rising leap in whole notes in contrast to the syncopated quarters and halves of the preceding text. The presentation is united by a single tonal motion—I to V/V in measures 1–4, and then ii–V–I in measures 5–8—while the rhythmic parallelism joins with the lyrical factors to make the n + n separation clear. There is no clear break three quarters of the way through the lyric, however. The comma after “down” provides some sense of caesura (though less strongly than the exclamation points after lines 1 and 2), but too early to cause an n + n partition; the extra phrase “is all that you can do,” which is neither the title nor climactic enough to serve as a reveal, renders the second half of the lyric too long to be plausibly halved by the comma. Therefore, the rhymes between “stocking” and “shocking” and between “down” and “town” are inner rhymes within a single 2n span rather than end-rhymes between two distinct n-length spans. [5.3] However, this is not to deny that the comma, along with the rhyming phrases on each side of it, generates a fragmentation within the 2n span that imbues it, lyrically, with characteristics of a sentential continuation. Line length also plays a subtle role in a progressive acceleration across the entire lyric: the lyrical presentation includes two lines of seven syllables and four stresses each (lines 1 and 2), and the lyrical continuation consists of sections of six syllables and three stresses (“Let your stocking fall down”), five syllables and two stresses (“for shocking the town”), and five and two again (“is all that you do”). Thus, the 2n second half of an overt n + n + 2n lyric (SLT3a) is not disqualified from subdividing and accelerating through repetitions, rhymes, and punctuation marks; on the contrary, these elements of continuation are frequent in the type, provided that they do not divide the second half of the lyric neatly in half to the same extent as in the n + n presentation. [5.4] The lyric, in fact, helps to ensure that Kern’s musical fragmentation does not project a clear boundary between measure 12 and measure 13, since measures 9–10 begin the continuation with the same melodic material as the first halves of each basic idea (measures 1–2, measures 5–6). Looking only at the syncopated rhythm and melodic contour, a 2-measure pattern is clearly repeated between measures 9–10, measures 11–12, and measures 13–14 (as is typical in a sentence with nested sentential proportion in its continuation). However, the lyrical clauses are misaligned with the musical patterning, with the comma falling in the midst of the second motivic unit (i.e., halfway through measure 11) and the completion of the “-own” rhyme falling in the midst of the third one (i.e., halfway through measure 13). The early appearance of “for shocking the town” a measure and a half before the last n of the phrase, and the spilling over of both this lyrical phrase and the dominant chord into the start of the last 4-bar hypermeasure (measures 13–16), disallows the 8-bar musical continuation from dividing in half any more strongly than the two-line lyrical one does. [5.5] In the more intricate SLT3b, or n + n + (n + n)→2n, the second half begins as if it were just a third n-length line continuing the pattern established by the presentation. However, by a linguistic sleight-of-hand, this third n can both stand on its own and serve as the first half of a longer lyrical continuation that spans the last 2n of the phrase. In this sub-type, a sentential musical setting is only latent until the third n is recontextualized by the fourth. (43) The n + n + 2n possibility offered by linguistic syntax can then be made manifest by a musical phrase that realizes the 2n potential. In this case, the reinforcing effect of the sentential music invites us to hear the lyric as if its 2n continuation had been inevitable all along; and, alternatively, the sentential ambivalence shown by the lyric until its last quarter offers us a way to hear the ultimately sentential music as a refreshing surprise. Examples 10 and 11 show two examples of this sub-type, “Delishious” by the Gershwins and “Something Wonderful” by Rodgers and Hammerstein. At first glance, each of these bears some resemblance to a Three-Item List + Reveal, owing to the three rhyming lines and the non-rhyming last one with climactic status. Indeed, if one reads the lyrics and attends primarily to the aaab rhyme scheme and the poetic meter, it is possible to experience each lyric as n + n + n + reveal. However, somewhat differently in each song, musical and lyrical factors combine to allow the last line to emerge from the penultimate one more subtly than a reveal does. [5.6] The consistent iambic trimeter of the Gershwin lyric, coupled with the delightfully clumsy—to Philip Furia, “tortured” (1996, 137)—rhymes of the three “-ishious” non-words, allows us to hear line 3 initially as a complete clause just as lines 1 and 2 were. We become aware of the absence of punctuation after “ambishious” only after line 4 continues the same clause, negating the syntactic independence of what precedes it. Rhyme, meter, and syntax aside, however, one can also perceive a hint right at the start of line 3 that a true sentential continuation has begun and not merely a third n-length unit. This more overtly sentential reading of the lyrics is assisted by the clear shift from “You” to “I” in line 3, with the third “-ishious” adjective describing the speaker rather than the lover. Reading the lyric, one can hear line 3 teetering ambivalently between n-length independence (like the two lines before it) and 2n-length interdependence (with a more essential connection to what comes after it). [5.7] The same ambivalence is portrayed musically in measures 5–6 with remarkably close musico-poetic correspondence. On the one hand, the motivic rhyme of the musical melody aligns with the ‘melodic’ factors of the lyric (rhyme and rhythm) to make the case for a third n-length statement. Gershwin begins measure 5 with a third statement of the three-note arpeggiated motive from the basic idea, even preserving the same pitch level as its immediately preceding iteration in measure 3. The [- 3 - / 1 2] declamatory schema (after Malin 2010) of the first list item is also preserved in the second and third ones. The underlying harmonic syntax, on the other hand, aligns with the linguistic syntax to initiate a single progression spanning measures 5–8. While the melodic <C–A –F> from measure 3 recurs in measure 5, the earlier harmonization as part of a dominant-ninth chord is replaced by a tonicization of the supertonic in measure 5, dissolving the melodic repetition by recontextualizing it as the start of a cadential ii-V-I progression spanning measures 5–8. Simultaneously, the declamation of line 4 shifts markedly to a downbeat-oriented [1 2 - - / 1], which permits ½ n fragmentation of the dotted-eighth rhythm in measures 5 and 6. The music points in both directions for only, and fully, as long as the lyric does (i.e., “I grow ambishious”); precisely when the lyric makes clear that a 2n continuation is underway (“to have you care”), the music does the same, repeating the arpeggiated motive one step higher to create a nested sentential proportion of ½ n + ½ n + n within the last four measures. The process is an almost exact musico-poetic analogue to the set of purely musical relationships captured by BaileyShea’s (2004) sentential type with dissolving third statement. The dissolution is brought about by a passage that, musically or lyrically or both, (1) does what the first two did for a third time (at least initially) and (2) simultaneously gains enough momentum to initiate a continuation that somehow exceeds a mere third like iteration. [5.8] Hammerstein’s lyric is subtly different because its first two lines are enjambed as well as its last two (see Example 11). The enjambment of lines 1–2 is weakened substantially, however, by both the trivial end-rhyme of “say” and the consistent iambic trimeter, which point toward an n + n partitioning. Rodgers’s music also thwarts the perception of enjambment here: fully three beats separate the end of line 1 from the start of line 2 musically, and the exact repetition of the basic idea from measures 1–2 to measures 3–4 further hinders a sense of oneness across measures 1–4. Line 3 preserves both the meter and the rhyme of lines 1–2, partitioning the first three quarters of the lyric sonically, if not syntactically, into three n-length modules. Here, though, Rodgers’s music makes no attempt at an n + n + n charade, replacing the undulating contour of the two basic ideas with a dramatic ascent through a ninth (B3 to C5) and overwriting the root-position plagal stasis of measures 1–5 with a less stable, inverted IV6 in measure 6. More strongly than in the Gershwins’ song, the music of measures 5–6 has already hinted that a 2n continuation is underway—as, perhaps, has the contrary “But” of line 3 by suggesting that a lyrical climax is to follow. The suggestion is taken up by a chain of descending fifths in the bass that links the E of measure 6 through ii7 to a half-cadential V7. The cadential progression supports downward leaps of a seventh (“Something”) and fifth (“wonderful”) that recall the ones in the basic idea (“He will,” “always”), but now imbued with the climactic force of downbeats by the sudden shift to trochaic meter in line 4 of the lyric. Unlike in lines 1–2, the lyrical enjambment across lines 3 and 4 is made manifest when the music creates a continuous unit across measures 5–8: melodically, as the rising gesture of measures 5–6 is complemented, rather than repeated, by the compensatory falling one of measures 7–8, and harmonically, through a cadential progression lasting all four measures. Rodgers and Hammerstein were particularly fond of the n + n + (n + n)→2n technique; it pervades their collaborative work. [5.9] Each of these two lyrics serves to demonstrate the fluidity of the boundaries between Sentential Lyric-Types by exhibiting some, but not all, of the traits of the List + Reveal. The Gershwin lyric begins with a three-item list of sorts, but its fourth line lacks the status of a reveal; the opposite is true of the Hammerstein lyric, which ends climactically with its title but, save the superficial repetition of the word “say,” does not open with a list. Moreover, both lyrics display a feature unique to SLT3b, whereby the dual status of the third line complicates the separation between lyrical presentation, continuation, and cadence. The latent potential in both lyrics for multiple readings invites measures 5–6 of the musical setting to link (through its lyrics) with the preceding presentation, to initiate continuation, and, retrospectively, to be a part of a 2n cadential progression. Fusion of continuation and cadential functions, called continuation→cadential by Caplin and Continuation / Cadence by Richards, is both a common strategy in settings of n + n + (n + n)→2n lyrics and a perfect match to them. The retrospective hearing of measures 5–8 as cadential all along, as opposed to just continuation with a cadential progression to come later, reinforces the retrospective lyrical reading of line 3 as “2n all along,” rather than as a third n-length unit to match the first two. If one were speaking rather than singing either of these lyrics, it would be challenging to deliver the third line such that the fourth did not come as a surprise; we must hear the end, of course, before we understand how it relates to what precedes it. The music can respond variously to this ambiguity, either complicating or clarifying it, and thereby revealing musico-poetic possibilities richer than what is found in either music or lyrics alone. [6.1] Whereas the first three Sentential Lyric-Types are inherently sentential on account of their proportions and/or their narrative trajectories, the fourth one is not. Lyrics of this type divide simply into two 2n halves (and often further into four n-length lines), a proportion that would seem a better match to periodic than to sentential treatment, particularly when coupled with either of the two most common rhyme schemes, aabb and abab. Yet, the sheer frequency of these symmetric lyrics among musical sentences in the Great American Songbook—20 percent of the sentences in this corpus—is evidence of a predilection for the musical phrase-type, even absent a lyric that demands it. SLT4 divides into two sub-types, one in which sentential features are latent and one in which they are absent altogether. In the former, internal rhymes or repetitions in the second half provide some sentential fodder that can be put to use by a more decidedly sentential musical phrase; in the latter, sentential music trumps the lyrical proportions and invites a close examination of the word-music interaction. [6.2] Loewe and Lerner’s “I Loved You Once in Silence” (Example 12) is an instance of a latently sentential 2n + 2n (SLT4a). Within the second 2n-length half, a rhyme opens the possibility for a corresponding musical ‘rhyme’ that creates acceleration. Poetically, the lyric provides few clues even as to its divisions into lines. The rhyme between “knew” and “too” clearly divides it in half, but the only other rhyme (i.e., “showing” and “knowing”) is implausible as an end-rhyme; a five-line lyric in rhyme scheme abccb is not out of the question, but the two c lines would be drastically unequal (i.e., ten versus six syllables, and five versus three stresses). The “knew”/“too” rhyme partitions the lyric into unequal ‘halves’ of 14 and 20 syllables, each of which logically divides in half at either a syntactic break (“I loved you once in silence / And...”) or a punctuation mark (“...showing, / All the while...”). Aside from having three and five stresses, respectively, each pair of lines is internally inconsistent with respect to poetic meter; an interpreted scansion, which is not the only possible one, appears in Example 12. A distinct semantic shift occurs at the end of the lyric, from love in silence to the feelings of the loved one, but the onset of this shift could be interpreted variously at either nine words from the end (“All the while not knowing you loved me too”) or just four (“you loved me too”). [6.3] Loewe’s music makes salient the one sententially cooperative rhyme, between “showing” and “knowing,” by beginning “all the while not knowing” earlier than it might have done, hastening to realize its potential for sentential continuation. That is, line 4 might have begun with two quarter-note anacruses (“all the”) at the end of measure 12, just as line 3 had done at the end of measure 8 (“trying”), which would have placed “while” on the downbeat of measure 13 corresponding to “so” on the downbeat of measure 9. However, line 4 begins half a measure earlier than this, which permits a musical parallelism between “showing” and “knowing” that accentuates their rhyme: both words now fall on downbeats, preceded by four quarter notes in a similar descending contour. “Showing” and “knowing” need not have been treated as musical rhymes, since they do not fall in the same part of their respective lines, but by jumping the gun rhythmically at the start of line 4, Loewe creates two interlocked instances of fragmentation to a level of ½ n, one musical and the other lyrical. The musical one, bracketed above on the score, occurs between measures 9–10 and their melodic sequence in measures 11–12; the lyrical one, bracketed beneath, is one measure later because of the rhyme and identical trochaic scansion of “keep my love from showing” and “all the while not knowing.” In effect, although there is no greater syntactic coherence between the last two lines than between the first two—and, in fact, one could argue that the opposite is true on account of the comma in the second half and the lack thereof in the first half—the encroachment of line 4 upon the four measures belonging to line 3 creates overlapping musical and lyrical repetitions that capitalize on a seemingly incidental inner rhyme to accelerate into a convincingly sentential continuation. Example 13. From George Gershwin and Ira Gershwin, “Love Walked In” and “Nice Work if You Can Get It”; and George Gershwin and B. G. DeSylva, “Do It Again” (lyrics only). [6.4] George Gershwin’s songs frequently employ coordinated musical and linguistic rhymes between the end of the third n and the start of the fourth. Interestingly, the technique spanned various SLTs as well as lyrics that do not fit neatly into any type (see Example 13). “Love Walked In” is an overt n + n + 2n (SLT3a); “Do It Again,” with lyrics by Buddy DeSylva rather than by Ira, begins as a Bookended lyric does (SLT2), but departs halfway through; and “Nice Work if You Can Get It” is a latently sentential 2n + 2n lyric (SLT4a). Despite their very different structures, all three lyrics include in line 4 an internal word or word pair that rhymes with the end of line 3, underlined in Example 13. In each case, the rhyme causes a repetition that sews across the boundary between line 3 and line 4 to strengthen the sense of a 2n continuation. The process can be linguistically clever, as with the recasting of “you can get it” from conditional to declarative by moving “if” from the beginning (in line 3) to the end (in line 4). 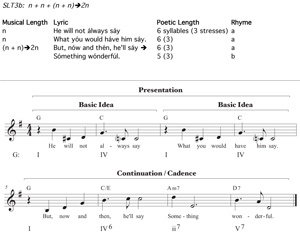 [6.5] As in “Nice Work if You Can Get It” (Example 14), a musical ‘rhyme’ often serves to highlight the sentential quality of the lyrical rhyme. The untransposed repetition of <D–E–G–A–B>, between “if you can get it” and “and you can get it,” creates fragmentation down to the level of one measure, or ½ n, but this acceleration spans across the border between line 3 and line 4 rather than occurring within line 3 as is more typical in continuations (i.e., ½ n + ½ n + n). Even in spite of the atypical musical rest in the middle of measure 6, the combined musical and lyrical repetitions soft-pedal the boundary between measures 6 and 7 (i.e., between lines 3–4) and suggest a 2n unit more strongly than either words or music would do on their own. [6.6] In the other sub-type, SLT4b, the lyric provides no assistance at all to a musical phrase that is sentential in spite of its lyric; on the other hand, as in Jerome Kern and Dorothy Fields’s co-written song, “I Dream Too Much” (Example 15), a lyric can acquire rich (if artificial) sentential characteristics on account of being squeezed into the phrase-type by its musical delivery. 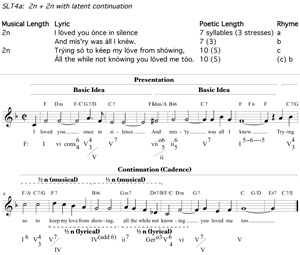 Although the lyric’s four n-length segments are far more distinct here than, say, in Lerner’s lyric in “I Loved You Once in Silence,” the n + n + n + n structure is still clearly grouped into 2n + 2n by both the aabb rhyme scheme and the shift in focus from “you” (lines 1–2) to “I” (lines 3–4). The first, second, and fourth lines are especially similar on two accounts: they each have six iambic feet as opposed to the third line, which is shorter by one, and each of them hints sonically at a nested sentential proportion within the line (i.e., ¼ n + ¼ n + ½ n) through inner rhymes and quasi-rhymes (i.e., “says” and “ness,” “dance” and “chance,” and “boast” and “most”). The lack of subdivision in the third line (which does not even feature ½ n fragmentation, let alone ¼ n) creates a kind of proportional bookending, since the lyric decelerates after two lines and then regains the latent ¼ n fragmentation in line 4—although this rounded quality is effected through fragmentation alone rather than through semantic trajectory as in Bookended lyrics. There is little hint of a sentential proportion in the larger scale of the lyric, however, particularly since it decelerates precisely where a typical sentence would do just the opposite. 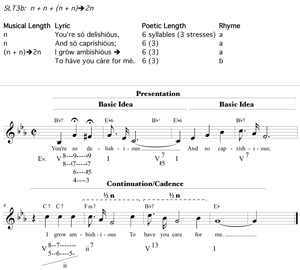 [6.7] Kern’s music matches the nested sentential proportions within lines 1 and 2 by means of similar designs within each four-measure basic idea. The repetition of a three-note pickup figure (<G–A–G> before measures 1 and 2, <C–D–C> before measures 5 and 6) emphasizes the ¼ n fragmentation suggested by the inner rhymes, but only subtly; the narrow ambitus of the melody glues together each basic idea as a unit. The comma in line 2 occurs precisely at this ¼ n + ¼ n division, which makes the fragmentation more salient than in line 1. As in line 3 of the lyric, the ¼ n fragmentation disappears beginning at measure 9 of the music. In fact, even the musical subdivision into ½ n units has neither rhymes nor punctuation marks in the lyric to obligate it; the single lyrical clause, “I am not gay enough to share a waltz,” is divided unintuitively into two segments (i.e., “I am not gay enough / to share a waltz”) by the ½ n + ½ n repetition of a rising, four-note melodic motive. Then, in the last four measures, the ¼ n fragmentation is restored as “tonight I boast,” “one of my most,” and “unhappy faults” are each set apart by a four-note musical fragment that recalls the <G–A–G> pickups from measures 1–4. Even though the three lyrical segments in line 4 are no more syntactically independent than those in lines 1–2, the music picks up the slack to create a more explicit sense of fragmentation at the end of the phrase than at the beginning: in place of the undulating stepwise motion that connects across each basic idea, the three melodic gestures in measures 12–16 are clearly separated by large leaps of an octave (with a fermata), a fifth, and a fourth. Thus, even more strongly than in lines 1–2, the musical fragmentation exceeds (and compensates for) the subtlety of the inner rhyme between “boast” and “most” to effect a lyrically uncorroborated and classically sentential gain in energy relative to the presentation. Example 16. From George Gershwin and Ira Gershwin, “Funny Face” (lyrics and music) and “But Not For Me” (lyrics only). [7.1] While the four SLTs discussed so far are the most frequent lyrical organizations of sentential phrases within the Great American Songbook, there are sentences with lyrics that match none of the four types as well as ones that display characteristics of several types. 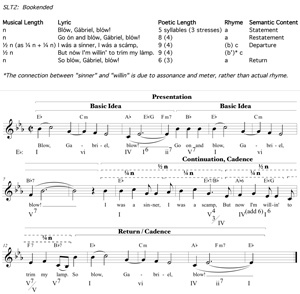 Lyrics that contain elements of two or more different SLTs offer multiple simultaneous conduits to the sentential features of their musical settings. One particularly interesting hybrid, which seems to have been a hallmark of Ira Gershwin’s lyric writing, actually contains traces of SLTs 1, 2, and 3. 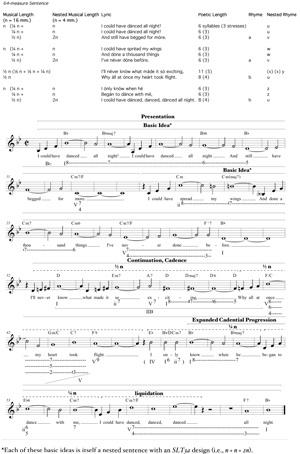 Variants of this design are found in songs such as “Love Is Here to Stay,” “Funny Face,” “Of Thee I Sing,” “But Not For Me,” “Do, Do, Do,” “Love is Sweeping the Country,” and “By Strauss.” Two of these lyrics appear in Example 16. Each of the first two n-length lines ends with the song’s title, so they rhyme trivially, but they often, as in “But Not For Me,” contain less trivial inner rhymes as well (e.g., “love” and “above”). While the initial statement and repetition of a central (and, here, titular) line of text is similar to the first half of a Bookended lyric, the insertion of different material prior to each iteration of the title creates at least some sense of an emerging list as in SLT1. (44) Each of these lyrics is biased more toward one type than toward the other, though. Line 2 of “Funny Face” is more a restatement than a second list item, although the addition of “sunny” does resonate with the List + Reveal type, in which subsequent items frequently incorporate rhyming synonyms with the first item. George Gershwin’s music highlights the additional lyrical activity in this second basic idea with additional harmonic change; in contrast to the static tonicized dominant of measures 1–4 (line 1), the tonic of measures 5–8 (line 2) is elaborated plagally on “sunny” (I), “funny” (IV7), “face” (I). Somewhat differently, the first two lines of “But Not For Me” begin with distinct clauses that, without the repetition of the title afterward, would be straightforwardly in line with a List + Reveal. The repetition of the titular phrase, “but not for me,” suggests the start of a Bookended lyric, but it also contributes essentially to the list-like quality, since this is a list of great things that are not happening to the protagonist. [7.2] However, the second halves of these lyrics realize neither the implications of SLT1 nor those of SLT2. Their ends lack the status of climactic reveals and, although the elaboration and accelerating rhymes of line 3 are typical of Bookended lyrics, these continue in line 4 rather than yielding to a final return of the opening motto to bookend the lyric. “But Not For Me” suggests sentential continuation by means of the sleight-of-hand characteristic of SLT3b, the n + n + (n + n)→2n. As in “Funny Face,” the third n-length line features an internal rhyme that fragments it into units of ½ n (i.e., “cutie” and “beauty,” “lead the way” and “clouds of gray”). Moreover, line 4 of “But Not For Me” continues the rhyme (i.e., “Russian play”), thereby forging a sonic link across the last 2n (as in the songs shown in Example 13); line 4 also creates a retrospective enjambment by completing the clause, “I’ve found more clouds of gray / Than any Russian play could guarantee.” In “Funny Face,” there is no enjambment, but the fragmentation intensifies to ¼ n in line 4 (“You’ve got,” “a lot”), creating a nested sentential proportion within the continuation that forges together the last 2n. [7.3] A clever wording at the very end of each lyric also provides a sense of closure in the absence of both a reveal and a bookended return. In “Funny Face,” the extension of “personality” with “for me” creates a dual sense of lyrical cadence, since either “-ee” syllable could complete the rhyme and end the lyric. Musically, the continuation of this phrase parallels with motivic fragmentation the lyrical fragmentation created by increasingly quick rhymes. A repeated two-measure rhythm between measures 9–10 (“For you’re a cutie”) and measures 11–12 (“with more than beauty”) fragments further to a repeated one-measure, or ¼ n, rhythm between measure 13 (“you’ve got”) and measure 14 (“a lot”). Finally, the music liquidates in measures 15–16 to repetitions of a single pitch (G4) on each syllable of “personality for me,” with “-ty” aligned on the downbeat of measure 16; the downbeat lends it plausibility as a cadential arrival, making the extension, “for me,” superfluous and surprising for both lyrical and metrical reasons. Something more complex is at work at the end of “But Not for Me.” The rhyming phrase, “than any Russian play,” initially continues the ½ n fragmentation established by “With love to lead the way” and “I’ve found more clouds of gray,” but only superficially; it is syntactically incomplete until “could guarantee” finishes it. (That is, the statement is not that the protagonist has found more clouds of gray than any Russian play has found.) These last two words, “could guarantee,” not only make syntactic sense of “Russian play,” but also bring the hybrid lyric full circle by trumping the “-ay” rhyme (between lines 3 and 4) with an “-ee” rhyme that links with lines 1 and 2 and, indeed, with the title of the song. [8.1] The discussion so far has been confined to sentences at the level of single, complete phrases, but this is not to discount the prevalence of sentential proportions either within sub-phrases (e.g., 2-, 4-, or sometimes 8-bar groupings without cadences) or across groups of multiple phrases. The openings of the refrains in Rodgers and Hart’s “Bewitched,” Rodgers and Hammerstein’s “Some Enchanted Evening,” and Cole Porter’s “Delovely” are but a few examples of sententially organized sub-phrases, which often link lyrical and musical factors in ways very similar to those already explored in complete phrases, but for the lack of a cadence. To what extent can the words and music of an entire song (excluding verse) interact to form larger-scale versions of the same sentential relationships discussed above? [8.4] The two separate clauses of the B section provide an opportunity for the music to fragment the melodic material of the A sections into ½ n + ½ n, and Loewe’s music in measures 32–35 highlights the inner rhyme of “know” and “so” through a further fragmentation to the level of ⅛ n, or two measures. Furthermore, the B and last A sections are joined lyrically in a way analogous to a smaller-scale n + n + (n + n)→2n, or SLT3b; the bridge begins by saying what Eliza Doolittle will never know, and the last A continues by saying that she only knows that when Henry Higgins began to dance with her, she could have danced all night. As a result, the lengthening of the three anacruses on “I only...”, from quarter notes (as in the first two A sections and the bridge) to half notes accomplishes more than just a written-out ritardando. By removing two extra beats of space between musical phrases, it helps to solder together the second half of the song’s lyric into a single thought: “I’ll never know what made it so exciting ... I only know when he began to dance with me...”. [8.5] Rather than restating the opening melody, the beginning of the last A section intensifies the ½ n fragmentation of the bridge by demarcating the ¼ n (i.e., four-measure) units more clearly than in the first two A sections; the rising melodic sequence and progression from tonic to predominant in measures 49–56 treat the two lyrical lines, “I only know when he / Began to dance with me” more energetically than the falling contour and static tonic across measures 1–16. The musical and lyrical fusion of the bridge and last A section, as part of an overriding sentential acceleration from n (first two A sections) through ½ n (B section) to ¼ n (last A section), is the most distinctive feature of the song. Finally, the lyrical liquidation that occurs precisely at the start of the climactic phrase (i.e. “danced, danced, danced”) corresponds to a musical one—the stuttering whole notes in measures 57–59—which reaches the melodic climax of E 5 just before the lyrically and musically cadential “all night.” A synthesis of musical and lyrical factors renders, across 64 measures, a beautifully expanded version of the sentential narrative that unfolds more commonly on a smaller scale. Indeed, the constant forward motion of this single long phrase is a perfect match to Eliza Doolittle’s giddy excitement; neither she, nor the lyric, nor its musical setting can rest. [9.1] The vast majority of sentences in this repertoire are musically normative, drawing their complexity from rich association with lyrics rather than from especially problematic musical factors. Having established the most common Sentential Lyric-Types and the corresponding interactions between words and music, I will now investigate the combined musico-poetic effect of those that do deviate from sentential norms. It is in these remarkable exceptions, of which I will discuss only three, that the phrase-type itself plays the role of a storyteller, drawing attention to a lyrical sentiment by means of an unexpected departure. [9.2] Lerner and Loewe’s “With a Little Bit of Luck” begins as a song about diligence, but hard work devolves into laziness just as a conventional 16-measure sentence is unwound into a 20-measure one (Example 18). The phrase begins with two four-measure basic ideas on tonic, which predict a 16-measure sentence. Lyrically, these two lines establish the capacity of man to do his work without complaint, and act as the first half of a potential SLT4 lyric (i.e., 2n + 2n). Measures 9–12, which accompany a repetition of the opening words, are a dissolving third statement that progresses conventionally to a tonicized subdominant. Unusually, and crucially, the revelation of the title comes next, as a non sequitur in the middle of the lyric, derailing a narrative about work ethic that would have ended conventionally without it. One could easily imagine the banal, but lyrically and musically functional, sentence shown in Example 19, which preserves the first ten and a half measures of Lerner and Loewe’s original. [9.3] However, the interjection of the title reveals the main point of the song—that, with a little bit of luck, Alfred Doolittle intends to escape his obligation and pass it off onto someone else. The immediate repetition of the title also effects a lyrical and musical acceleration to ½ n + ½ n for the only time in the phrase. The musical silence after “But,” along with the lack of a resolution after the applied V7/V, halts the phrase’s forward tonal motion and forces it to start fresh just as the lyric does. The last eight measures, including the title, are themselves a sentence—a lyrically revised one—which stands alone as a clear n + n + 2n (SLT3a). 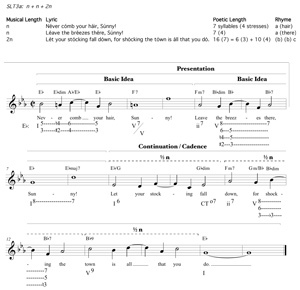 Thus, there is a dual demand on the climactic “blinkin’ work” line: it provides 2n-length cadential closure to the eight-measure sentence about laziness (beginning in measure 13), and also serves as the n-length cadential closure to the now-expanded, now-redirected, 20-measure sentence begun at the outset. Anything but parenthetical, the title line is central to the reversal of the lyrical theme and to the recharting of a tonal path toward a cadence. The convergence of musical and lyrical impulses at two sentences—one nested within, and disruptive of, the other—perfectly allows the titular element of luck to hijack the musico-poetic phrase. Example 20. From Richard Rodgers and Oscar Hammerstein II, “I Have Dreamed” (measures 1–16 only). [9.5] Following suit, the musical sentence in measures 1–16 is quite standard. 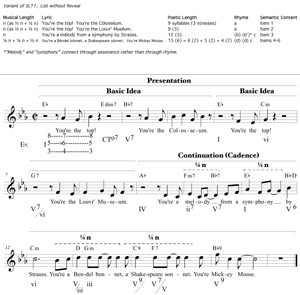 The first two basic ideas (measures 1–4 and measures 5–8) remain on tonic, beginning identically as the lyrics do and ending with just slight variation. The third iteration of the same melodic motive is transposed chromatically up a whole tone at measure 9, which creates demand for forward tonal progression as is customary for a continuation. The intensity of this chromaticism helps to convey the additional passion of this most specific and most intimate of the three dreams. The F major harmony ultimately acts as V/V, resolving through dominant to tonic in exact coincidence with the lyrical reveal of “When you’re close.” Importantly, however, the arrival on tonic in measure 13 is denied its authentic-cadential potential—which, though early, is plausible because it arrives on a hypermetrical strong beat—by the lyrical repetition of “close to me,” which overwrites the potential PAC with a tonicized half cadence. Thus, this 16-measure sentence is left tonally open to match the lyrical yearning: the song has foretold of the closeness of lovers, but it still lacks a punchline that converts the stuff of dreams into an actual embrace. [9.6] The half cadence at measure 16 invites several possibilities for what follows, the most typical of which is a parallel phrase with a stronger cadence to complete a parallel period. Example 21 shows the complete passage. Indeed, if measure 17 were to begin on tonic rather than on III, one would quite certainly hear a 32-measure period with a repeated cadential progression (measures 33–36) motivated by a deceptive cadence (measure 32). However, I would like to draw attention to several characteristics of measures 17–33, some lyrical and some musical, that gradually open up at least the possibility for a richer hearing that relies on a retrospective reinterpretation of measures 1–16 as just the presentation of a giant sentence spanning measures 1–36. [9.7] In spite of the melodic similarity to measure 1, the sense of restart at measure 17 is substantially weakened by its transposition to the remote key of G major. One could hear it as the off-tonic beginning of the second phrase in a continuous period, but Rodgers’s particular choice of G major offers the listener a patterned way to recontextualize the music that has already occurred. The F major that begins at measure 9, heard earlier as initiating continuation through a tonal departure to II, is recast as the second basic idea in a sequentially organized sentence of twice the length. This F major now participates in a pattern of successive upward transpositions creating a 24-measure presentation with three basic ideas: the first one in E-flat major (measures 1–8), the second one a major second higher in F major (measures 9–16), and then a third one yet another major second higher in G major (measures 17–24). The melodic similarity of measure 9 to measure 1, along with the lack of overt clues to continuation (e.g., acceleration in surface or harmonic rhythm) in measures 9–16, makes it plausible to reinterpret these eight measures as still presentation rather than continuation. Moreover, the erstwhile half cadence at measure 15 was weak to begin with on account of the upper-voice leading tone (which allows a preparatory D7 to enter in measure 16 under the same vocal pitch). [9.8] Just as a weak half cadence melts in measure 16 into the dominant of a third sequential basic idea, the lyrical reveal that it accompanies turns out to be still in the midst of an ongoing list that will not find its true reveal until later. In support of the musical factors discussed above, the lyrics beginning at “How you look” also permit a reinterpretation of the preceding lines of text. Rather than starting anew, the lyric continues unabated with a list of the loved one’s traits that appeared in the dream, calling into question whether the putative reveal of the 16-measure sentence (i.e., “when you’re close”) actually managed to conclude anything. The addition of yet another list item invites us to hear an SLT1b of twice the length (i.e., n = 8 measures) in which the first two-line list item focuses on touching the loved one (“arms”), the second one on hearing (“words”), and the third one on seeing (“view”). (49) Tonally, these three list items become increasingly dream-like, the first rooted in tonic, the second on II (which is rationalized as V/V returning to tonic), and the third in the more remote III. A beautiful symmetry emerges to guide the transitions between dreams and sober reflections upon them. The D4 of measure 15 is converted in measure 16 from a half-cadential leading tone into the yearning dominant of G major, melting the weak reveal into the third dream; the opposite happens to the D5 of measure 23, which ushers us back into the present (and the real reveal) as 5ˆ in G major is recontextualized as the leading tone in the post-dream, tonic home of E-flat. [9.10] Musically, the continuation (measure 25–) gains momentum through progressive fragmentation that results in a nested sentential proportion. 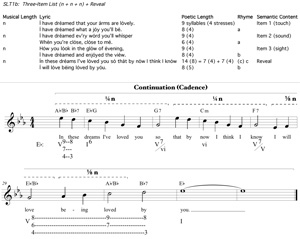 The six-note melodic setting of “In these dreams I’ve loved you so” is repeated exactly on “that by now I think I know,” with musical ‘rhyme’ and rhythm staying in sync with poetic rhyme and meter; this creates fragmentation at the level of ¼ n (recalling that the basic ideas are each 8 measures long). In fact, the plentiful 14 syllables and 8 stresses of this lyrical line are essentially two lines in the musical space of one, ratcheting up the surface rhythm all of a sudden to jumpstart the sentential continuation. The melodic repetition is reharmonized, though, to end on a dominant of the dominant that anticipates a cadential phrase. A cadential chord arrives as expected at measure 29 underneath a further fragmentation of “what it’s like” and “to be loved” to ⅛ n, leaving just the cadential arrival to follow. The climactic ascent to E 5 in the melody in measures 28–32 is conducive to a perfect authentic cadence, but remember that the lyric cannot conclude here; the cadence has the rug pulled out by a grand tonicization of the submediant, which, like the lyric that is still talking about being loved in the abstract, still seeks actual closure. [9.11] The sententially proportioned continuation (measures 25–32) now must be expanded by half to accommodate a lyrical reveal that takes three rather than two lines to come to the point, so the submediant initiates an applied ii–V progression to tonicize the dominant. The highly charged and suggestive F9( 11) chord in measure 32—a musical colon if there ever were one—attracts attention to the lyrical reveal-within-the-reveal of “I will love being loved by you,” paving the way for the grandly repeated cadential progression (measures 33–36) to get it right along with the lyric. One could imagine a phrase that finishes within 32 measures by removing the lyrical phrase that merely treads water (i.e., “what it’s like to be loved by you”) and utilizing its melody to reach both lyrical and musical cadences at the expected time (Example 22). The consequence of Rodgers and Hammerstein’s expansion is profound, though, for it is the denial of both musical and lyrical resolution in measure 31 that makes us certain to await with bated breath the overdue closure trumpeted by the yearning chord of measure 32. The exuberantly high vocal register just barely attained by the failed cadence in measures 31–32 continues unabashedly through this promise to deliver, now entirely at the top of the protagonist’s lungs, the long-awaited climax. [9.12] The sentential reading that I have suggested is rewarding precisely because it requires musico-poetic awareness to be convincing—because it is in no way foretold by what happens in measures 1–16 and instead gradually gains traction as the lyrics and music passionately conspire in measures 17–36 to broaden the scope of the phrase. The tonal departure in measure 17 and continuation of the lyrical list overwrite the tentative pause that precedes them and search for a musical and lyrical cadence of twice the scale. The demand for a cadence in measure 32 is further heightened by the internally sentential music and words of measures 24–32, which themselves propel more locally toward the same arrival point as the entire 32 measures do more globally. The non-cadence and non-reveal in measure 32, then, capture both tracks of energy and focus them on the now doubly important four measures that follow, which harness the musical and lyrical energies that have accrued throughout the phrase. Example 23. From Richard Rodgers and Lorenz Hart, “Isn’t it Romantic?”. [9.13] The normative (even pedestrian) sentence in “With a Little Bit of Luck” is steered off track to reveal the catch of the song, while the one in “I Have Dreamed” is swallowed up by a larger one that dwarfs its musico-poetic scope. In Rodgers and Hart’s “Isn’t it Romantic?” (Example 23), sentences both barely and fully realized take on the roles of dramatic agents that closely parallel a lyrically expressed emotion in musical terms. We might imagine in this song two characters with analogous yearnings. The first is a singer-as-narrator who wants to escape the mere observation of romantic imagery and get to the heart of the matter, finding out whether these symbols portend heartbreak or actually represent true love—or, who wants to stop listing romantic symbols and make something more out of them, learning whether they are evidence of romance and not just hollowly romantic. A second and sympathetic character, this one musical, seeks to escape the rut of paired basic ideas and make something more of those by accelerating, or spinning forth, or somehow realizing a satisfying sentential continuation. The song divides into two phrases. The first phrase can be read both musically and lyrically as a half-hearted sentence, but is disappointing in both respects; the n + n presentation in its first half is followed by a lackluster second half that does little more than state another, contrasting n + n pair. The second phrase begins just as the first does, musically, but soars musico-poetically at its end, utilizing all of the sentential tools at its disposal to exceed an unsatisfying observation with an all-meaning plea. [9.14] The lyric begins as a list of items that personify elements of nature (e.g., the night, the shadows, the breezes), hearing into their sounds a song of love. The first two items blend aspects of the List + Reveal with those of the Bookended type by beginning with the titular question and listing different images that conjure it. This question, “Isn’t it romantic?”, could be read initially as rhetorical given the certainty with which the protagonist hears the romantic symbols conspiring to encourage him to love. However, the third and fourth lines realize neither a bookend nor a fully satisfying reveal; they shed the now-redundant titular motto, but then add to the list of romantic conspirators by describing the breezes and the world at large. The list gains in intensity by broadening from specific objects to “all the world,” and reaches somewhat of a lyrical cadence by revealing the message that the protagonist is projecting onto these symbols (i.e., “You were meant for love”). Poetic structure links lines 1–2 and lines 3–4 as two distinct pairs, but does little to build sentential momentum in the second half of the lyric. The inner rhyme of “playing” and “saying” links lines 3 and 4, but does not cause fragmentation below the level of n; moreover, this rhyme does not distinguish lines 3 and 4 from lines 1 and 2, which also feature an inner rhyme (i.e., “night” and “write”). Like the inner rhymes, the end-rhyme scheme of aabb suggests two pairings of lines, as does the poetic meter. Thus, there is only marginal energy gain to be heard in lines 3–4. [9.15] The musical phrase initially supports the promise of a lyrical reveal after line 2, introducing a chromatic D-flat in measure 8 to usher in a tonicization of the supertonic, and inviting a tonally forward-moving continuation to follow. Measures 9–11 gain momentum exactly as a continuation often does—adding tonal motion by tonicizing ii (measure 9) and then vi (measures 10–11), and reaching the melodic high point (D5) in measure 10—but they then read the ambivalence in lines 3 and 4 of the lyric, losing steam in exactly the place where a continuation should push forward most. The consecutive whole notes in measures 12 and 13 deflate the sense of acceleration, and tonicizations of IV (measure 13) and then ii (measure 14) do little to resuscitate the continuation because they support an only slightly reharmonized repetition (in measures 13–15) of the same melody from measures 9–11. The combination of melodic repetition and rhythmic deceleration between measure 12 and measure 13 serves to partition the supposed continuation of this 16-measure sentence into a debilitating n + n proportion that fails to provide satisfying continuation to the n + n presentation in measures 1–8. (In this sense, the music makes use of the lyric’s poetic structure, which suggests the same division of x + x + y + y.) Moreover, the D-flat of measure 8 returns an octave lower in measure 16 to strip all but a greatly attenuated sense of arrival from the purportedly half-cadential dominant. This second D-flat resolves not comfortably downward as it did in measure 9, but awkwardly upward (if a leading tone counts as a resolution at all) and only in elision with the beginning of the second phrase. The singer has not moved past his account of supposed hints at romance, leaving him still to question their truthfulness and meaning in the next stanza; in strikingly direct parallel to the lyrics, the first musical phrase depends upon the second one for its resolution. [9.16] To the extent that the hanging D-flat of measure 16 casts doubt upon the veracity of what the world is saying, the question at the start of the second lyrical stanza might be read differently from the one at the start of the lyric, as now an earnest inquiry (i.e., “Isn’t it romantic?”) as opposed to a rhetorical flourish (i.e., “Isn’t it romantic?”). The last two lines bring this uncertainty to a crux as the speaker now interrogates the romantic symbols directly rather than simply observing and interpreting them. He even asks twice, in a way that emphatically overwrites the lackluster n + n lyrical separation that had taken place in the previous phrase. The first question—“Sweet symbols in the moonlight, do you mean that I will fall in love perchance?”—occupies 18 syllables in contrast to the merely 5 that follow, ensuring that the musical setting will sew across the three-quarters boundary that had put the brakes on the first phrase. Rodgers’s continuation (measure 25) begins as his first one (measure 9) had done, but then fragments the dotted quarter / eighth rhythm continuously through two whole measures (27–28). The ascent to the newly climactic F5, supported by the indivisible lyrical phrase “in love,” unequivocally denies segmentation at the bar line before measure 29, thereby sealing the continuation together as 2n rather than merely n + n. The melodic breath is postponed to just one measure before the end of the phrase. [9.17] Finally, the melodic motto used to set the initial “Isn’t it romantic?” (measure 1) returns at the very end (measures 30–31) but means something very different here, and not just because it is an octave higher. Since this short line now needs to rhyme with the immediately preceding “perchance,” the speaker demands to know not whether the environment is romantic, but whether his feeling is indeed romance: “Isn’t it romance?” This melodic and lyrical return evokes the Bookended lyric-type, particularly since it is recontextualized and made climactic by the profound gain in lyrical and musical energies that took place during measures 27–29. It does more than return to the opening motto, though; it transforms that motto into a summation of not only the second stanza, but the entire 8-line lyric as well. Simultaneously, both lyrical and musical urges are fulfilled. This beautifully crafted song owes the climactic status of its last two lines to an inseparable dialogue between musical and lyrical factors—lyrically, the change of address, the question that gets to the heart of the matter, and the continuous lyrical unit spanning 2n, and musically, the motivic fragmentation, the acceleration in harmonic rhythm, and the attainment of the melodic climax. Thus, the song is more than a period of two large phrases; at the very core of its narrative is the potential of an initial n + n repetition either to realize or not to realize its full sentential (and romantic) promise. [10.1] The sentential impulse that pervades the Great American Songbook is just as much lyrical as it is musical. Music and words interact through a set of sentential proportions and drives that play central roles in songwriting and text expression, and Sentential Lyric-Types offer ways to classify this give-and-take and to reveal some of the musico-poetic nuance in these songs. Even beyond the clear cases of perfectly aligned music and lyrics, the sentence seems to be fundamental enough to allow one parameter to make manifest a potential that is only latent in a seemingly incidental feature of the other. Moreover, as I have demonstrated, the phrase-type is at the core of storytelling to the extent that it can serve as a metaphor for lyrical sentiment, its peculiarities portraying elements of a song’s narrative. Thus, the aspect of the sentence that sustains the greatest interest in this music is the rich dialogue that is facilitated when words and music subtly enrich and interweave with each other through the conduit of this phrase-type. [10.2] Further work on this topic might follow several paths: first, a consideration of sentences by more and especially by more recent songwriters for the theater, particularly those who are or were both lyricists and composers. The songs of Stephen Sondheim are particularly fertile in this regard, given the uncanny unanimity of musico-poetic voice that they often display, and also in light of the great deal that he has said and written about his own craft. Especially illuminating would be an investigation of particular sentential songs, by him or by others, for which the specific compositional timeline and process are known, including aspects of music and lyrics that were revised on account of the other. It may reveal something valuable about the (deliberate or intuitive) adoption of the sentence as a songwriting frame to trace the word-music interaction chronologically through the creative process as well as in the finished songs themselves. In addition, the relationship between words and musical form in the genre could be explored more generally by a precise account of the musico-poetic characteristics of periodic and otherwise non-sentential phrases, and by a more detailed classification of larger lyrical designs that span several phrases or entire songs. There may well be lyrical analogues to, and text-expressive potentials in, the proportions and energies of both smaller and larger musical forms. All of this would provide yet a clearer picture of both the tricks of the songwriters’ trade and the remarkable subtlety of their craft, and further clarify the nature of musico-poetic storytelling in this fertile and elusively complex genre of American music. Attas, Robin. 2010. “Sarah Setting the Terms: Defining Phrase in Popular Music.” Music Theory Online 17, no. 3. BaileyShea, Matthew. 2002–03. “Wagner’s Loosely Knit Sentences and the Drama of Musical Form.” Intégral 16/17: 1–34. BaileyShea, Matthew. 2004. “Beyond the Beethoven Model: Sentence Types and Limits.” Current Musicology 77: 5–33. —————. 2004. “Beyond the Beethoven Model: Sentence Types and Limits.” Current Musicology 77: 5–33. Braheny, John. 2006. The Craft and Business of Songwriting, third edition. Cincinncati: Writer’s Digest Books. Caplin, William E. 1998. Classical Form: A Theory of Formal Functions for the Instrumental Music of Haydn, Mozart, and Beethoven. Oxford: Oxford University Press. Citron, Stephen. 1991. The Musical From the Inside Out. London: Hodder and Stoughton. Covach, John. 2005. “Form in Rock Music: A Primer.” In Engaging Music: Essays in Music Analysis, edited by Deborah Stein, 65–76. New York: Oxford University Press. Covach, John. 2010. “Leiber and Stoller, the Coasters, and the ‘Dramatic AABA’ Form.” In Sounding Out Pop: Analytical Essays in Popular Music, edited by Mark Spicer and John Covach, 1–17. Ann Arbor: University of Michigan Press. —————. 2010. “Leiber and Stoller, the Coasters, and the ‘Dramatic AABA’ Form.” In Sounding Out Pop: Analytical Essays in Popular Music, edited by Mark Spicer and John Covach, 1–17. Ann Arbor: University of Michigan Press. Davis, Sheila. 1985. The Craft of Lyric Writing. Cincinnati: Writer’s Digest Books. de Clercq, Trevor. 2012. “Sections and Successions in Successful Songs: A Prototype Approach to Form in Rock Music.” Ph.D. diss., University of Rochester. Forte, Allen. 1993. “Secrets of Melody: Line and Design in the Songs of Cole Porter.” The Musical Quarterly 77, no. 4: 607–47. Forte, Allen. 1995. The American Popular Ballad of the Golden Era, 1924–50. Princeton: Princeton University Press. —————. 1995. The American Popular Ballad of the Golden Era, 1924–50. Princeton: Princeton University Press. Forte, Allen. 2001. Listening to Classic American Popular Songs. New Haven: Yale University Press. —————. 2001. Listening to Classic American Popular Songs. New Haven: Yale University Press. Furia, Philip. 1990. The Poets of Tin Pan Alley: A History of America’s Great Lyricists. New York: Oxford. Furia, Philip. 1996. Ira Gershwin: The Art of the Lyricist. New York: Oxford University Press. —————. 1996. Ira Gershwin: The Art of the Lyricist. New York: Oxford University Press. Jenness, David and Don Velsey. 2006. Classic American Popular Song: The Second Half-Century, 1950–2000. New York: Routledge. Gershwin, Ira. 1973. Lyrics on Several Occasions. New York: The Viking Press. Hammerstein, Oscar II. 1985. Lyrics. Milwaukee: Hal Leonard Books. Krebs, Harald. 2013. “Sentences in the Lieder of Robert Schumann: The Relation to the Text.” Keynote address at the Pacific Northwest Graduate Student Conference, University of Victoria, February 9. Malin, Yonatan. 2010. Songs in Motion: Rhythm and Meter in the German Lied. New York: Oxford University Press. Nobile, Drew F. 2011. 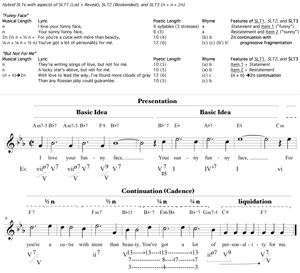 “Form and Voice Leading in Early Beatles Songs.” Music Theory Online 17, no. 3. Pattison, Pat. 2012. “Similarities and Differences Between Song Lyrics and Poetry.” In American Made Music: Poetics of American Song Lyrics, edited by Charlotte Pence, 122–33. Jackson: University Press of Mississippi. Richards, Mark. 2011. “Viennese Classicism and the Sentential Idea: Broadening the Sentence Paradigm.” Theory and Practice 36: 179–224. Rothstein, William. 2007. Phrase Rhythm in Tonal Music. Ann Arbor: Musicalia Press. Rodgers, Stephen (forthcoming). “Sentences with Words: Text and Theme-Type in Die schöne Müllerin.” Music Theory Spectrum 36, no. 2. Schmalfeldt, Janet. 2011. In the Process of Becoming: Analytical and Philosophical Perspectives on Form in Early Nineteenth-Century Music. New York: Oxford University Press. Sondheim, Stephen. 2010. Finishing the Hat: Collected Lyrics (1954–1981) with Attendant Comments, Principles, Heresies, Grudges, Whines and Anecdotes. New York: Alfred A. Knopf. Sondheim, Stephen. 2011. Look, I Made a Hat: Collected Lyrics (1981–2011) with Attendant Comments, Amplifications, Dogmas, Harangues, Digressions, Anecdotes and Miscellany. New York: Alfred A. Knopf. —————. 2011. Look, I Made a Hat: Collected Lyrics (1981–2011) with Attendant Comments, Amplifications, Dogmas, Harangues, Digressions, Anecdotes and Miscellany. New York: Alfred A. Knopf. Starr, Larry and Christopher Waterman. 2010. American Popular Music from Minstrelsy to MP3, third edition. New York: Oxford University Press. Summach, Jay. 2011. “The Structure, Function, and Genesis of the Prechorus.” Music Theory Online 17, no. 3. Webb, Jimmy. 1998. Tunesmith. New York: Hyperion. Wilder, Alec. 1972. American Popular Song: The Great Innovators, 1900–1950. New York: Oxford University Press. 1. 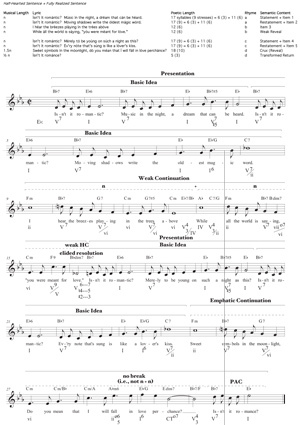 For overviews of the 32-measure popular song form, see Forte 2001, 17–20; Covach 2005, 69–70; Covach 2010; Everett 2009, 143; and Starr and Waterman 2010, 66–85. Forte (1993) and Starr and Waterman list both AABA and ABAC as standard 32-measure forms in the repertoire, which are called “popular song form” and “show tune form” in Citron 1991, 55–58. 2. For this repertoire, I prefer “phrase-type” over “theme-type,” the term adopted by William Caplin (1998). “Theme” is not as good a fit to songs of the Great American Songbook as it is to Classical instrumental works, simply because the former are usually too short to permit the kind of longer-range thematic development essential in the latter. 3. Throughout the article, “lyrical” will mean “pertaining to lyrics” (rather than cantabile), thereby distinguishing elements of phrase that derive from words from those that derive from music. 4. Agreeing with Stephen Rodgers (forthcoming), I consider the entire sentence a single phrase, rather than conceiving of a presentation phrase and a continuation phrase as Caplin does (1998, 35–45). As Caplin acknowledges (page 45), the only true cadence comes at the end of the sentence, rather than at the end of the presentation. Likewise, the lyrics that I discuss are complete thoughts only when taken as wholes. Each example shows an annotated lyric on its own as well as a condensed and annotated representation of the musical phrase. I have preserved the original published key even when it does not match the sounding key of the provided recording. 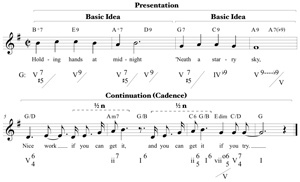 The chord symbols match the published ones except where the latter are misleading (e.g., when they exaggerate inner-voice motion by portraying it as a change in chord root); Roman numerals clarify and, in some cases, capture details not shown by the melody and chord symbols alone. Of course, each recording deviates slightly from what is shown. 5. I use Caplin’s (1998) terms, “presentation,” “basic idea,” and “continuation,” throughout. These are bracketed above the score and frequently include anacruses in order to align with complete lyrical units (e.g., “I have no will”). Agreeing with Mark Richards (2011) and Matthew BaileyShea (2004), I do not require the presentation to be tonic-prolongational. My specification of at least two basic ideas agrees with Harald Krebs’s definition (2013), and excludes what Richards has called ‘monofold’ sentences, which contain just a single basic idea. I consider the repetition of a basic idea an indispensable component of both musical and musico-poetic sentences, as it establishes a proportion against which the continuation can build momentum. 6. This definition of continuation is only subtly different from the one formulated by Harald Krebs (2013) and adopted by Stephen Rodgers (forthcoming), which requires a continuation to be more active and unstable than the presentation; and from Mark Richards’s (2011), which requires acceleration of some sort (e.g., in harmonic rhythm, surface rhythm, or length of motivic units). Even in the absence of acceleration or increased activity, continuation can be brought about by an indivisible second half of the phrase that, on account of a single tonal progression or melodic grouping, does not breathe halfway through as the presentation does. 7. For further discussion of how both poetic structure and poetic content can create a sentential presentation, see both Rodgers forthcoming, and Krebs 2013. 8. These n-based designators show the musical lengths of lyrical segments; thus, ½ n means one measure here. By referring to the length of a lyrical line as a multiple of n, I do not mean to specify an exact number of syllables or of poetic feet that is held constant for each n within the lyric. This is because poetic structure and the amount of music occupied by a given number of syllables are often inconsistent within individual songs. The number of syllables or stresses in an n-length lyrical segment may be, but often is not, exactly double that in a ½ n-length lyrical segment. 10. My likening of this last line of the lyric to a musical cadence is assisted by Caplin’s sensitive problematization of the term “cadence.” Distinguishing the moment of cadential arrival from the span occupied by cadential function (which includes the entire progression leading up to the arrival), he states: “Thus, the initial harmony of the progression marks the beginning of cadential material (be it a short idea or a full phrase), and the onset of the final harmony articulates the point of cadential arrival” (1998, 43). The notion of cadential progression is particularly important to a lyrical understanding of closure, since it is seldom possible to point to a particular word or exact moment that brings closure to a lyric. Rather, it is an entire clause or sentence that, as a syntactically interdependent unit akin to a cadential progression, offers conclusion. 11. For fuller discussions of this distinction, see Braheny 2006, 42–44; Forte 2001, 23–24; Forte 1995, 28; Hammerstein 1985, 4; James T. Maher (in Wilder 1972, xxvi); Pattison 2012; and Sondheim 2009, xvii. The distinction is also implicit in Philip Furia’s (1996) account of Ira Gershwin, and in manuals for lyricists (e.g., Davis 1985, Webb 1998). 12. This is not always the case, however, particularly when poems were intended from the start to be set by music, or even composed with particular musical rhythms in mind; see Malin 2010, 4. 13. Forte’s playful term “pitch painting” (1995, 28) relies on a view of lyrics as aptly “setting” already written music rather than the reverse. In addition to historical accounts, there are several specific discussions by the lyricists themselves. Sondheim (2009, 43–44), for example, reports on West Side Story, for which Bernstein’s music almost invariably came first. Oscar Hammerstein writes that, prior to his collaboration with Richard Rodgers, he always wrote words to existing music. He also describes the variability of the process: “There is, as a matter of fact, no invariable or inevitable method for writing songs. Sometimes the words are written first, sometimes the music. Sometimes two or more collaborators lock themselves in a room and write words and music at the same time. The kind of songs, the individuals involved and the conditions under which they work dictate the process” (1985, 4). 14. This conception of phrase resonates with Robin Attas’s (2010) definition for popular music, which requires a goal-directed motion and a conclusion effected through not only harmony, rhythm, and melodic contour, but text as well. Several factors can contribute to lyrical closure, including both sonic ones (e.g., completion of a rhyme scheme) and semantic ones. 15. Forte’s surveys (1995 and 2001) are the most wide-ranging accounts of word-music interactions across this genre, and he frequently links musical characteristics including form to lyrical ones. He does mention the bar form in reference to some particular songs, although not as a principal means of musical or lyrical organization throughout the repertoire. 16. There are, of course, many exceptions to these songwriting collaborations outside the corpus. Far from trying to be comprehensive of the genre, I have limited the list to five composers so that several of each one’s songs can be discussed. The work of Harold Arlen, Irving Berlin, Frank Loesser, Jerry Herman, Jule Styne, and many others belongs just as essentially to the same tradition, and their songs often display very similar sentential designs to those treated in detail here. 17. “Sectional verse” and “sectional refrain” are Covach’s (2005, 70) helpful terms for distinguishing the meanings above (i.e., the introductory and main sections of a popular song) from the different meanings that “verse” and “refrain” typically have with regard to pop music. 18. This sentential taxonomy contrasts with topically organized schemes such as Ira Gershwin’s in Lyrics on Several Occasions (1973). Gershwin groups his own lyrics according to sentiment: “The Not Impossible He,” “Divers Duets,” “The Importunate Male,” etc. My taxonomy is intentionally unspecific with regard to what the lyrics are about, focusing instead on the proportions and trajectories that link with sentential qualities of the music. 19. Notable exceptions include Caplin’s (1998) distinction between exact, sequential, and statement-response types of repetition in the presentation, which Stephen Rodgers (forthcoming) correlates with emotional states in Schubert’s Die schöne Müllerin, and Mark Richards’s (2011) categorization of sentences by their number of basic ideas (i.e., monofold, bifold, and trifold). 20. When the reveal is titular, it acquires a dually climactic status since, as Forte notes (1995, 30), it is usually the title and its melody that come first or most easily to mind when we recall a tune from this genre. 21. This is not meant to say that these lyrical sub-types are always paired with the corresponding musical type (although this may be the most natural word-music fit), but rather that they do lyrically something similar to what the corresponding musical type does musically. 22. Jimmy Webb devotes a substantial discussion to the importance of placing the lyric’s title or principal idea in an appropriate spot. “To elaborate,” he instructs, “the writer will want to work hard to set up a situation or relationship in the main body of the song that will cause the trite title to land with unexpected force...” (1998, 44). The point is an important one: the reveal is often known well in advance, particularly if it is the title, but the accrual of tension or interest in the preceding lines can elevate the status of the reveal to that of a lyrical cadence. 23. Everett’s (2009) SRDC model is appropriated by Jay Summach (2011) to analyze sentences in pop songs. The distinct functions of Statement/Restatement, Departure, and Conclusion serve as useful references against which to describe alterations and expansions of the sentence into the larger and more independent modules of Verse, Pre-Chorus, and Chorus, respectively. Nobile (2011) discusses the connection between the SRDC model and Beatles lyrics, noting how a textual idea is stated, restated, continued, and concluded. SLT2 is more precise about the nature of this lyrical conclusion, requiring a reprise of the initial statement rather than an introduction of new material at the end. 24. Trevor de Clercq (2012, 154–55) draws a helpful distinction between the sentence and the SRDC, noting the possibility of a fused continuation/cadential function in the former as a main difference. This accounts for why the SRDC is a good fit for many Bookended lyrics, but is less well suited to sentences in which the continuation is not best described as a departure from the presentation (e.g., SLT1a, SLT1b) or as a separate function from the cadence (e.g., SLT3). 25. The musico-poetic analogy is inexact, however. In the Beethoven, we can point to a specific climactic moment (i.e., the C6 in measure 7) where the intensification of the preceding material culminates, and thereafter dissipates through the descending melodic sixth and the half cadence. Linguistic syntax often constrains a lyrical reveal to play both roles, climax and cadence, simultaneously and indistinguishably. 26. For Krebs (2013), the stability and sense of rounding-off secured by the terminal return of the basic idea are enough to exclude these AABA phrases as altogether separate from sentences. Like Rodgers (forthcoming) and BaileyShea (2004), I do count them as sentences due to the gain in momentum that is still possible during the phrase’s third quarter. 27. Another common lyrical strategy is to set the scene in the two n-length items, and then to take action in the two ½ n-length items in order to motivate the reveal. Lines 1–2 of Lerner and Loewe’s “Get Me to the Church On Time” introduce the impending marriage of Alfred Doolittle and lines 3–4 signal his decision to imbibe on the eve before; the reveal synthesizes the two, commanding his pals to get him, regardless of what state he is in, to the church. It is also possible for a list to include redundant items. The first two list items of “Let’s Call the Whole Thing Off” by the Gershwins (i.e., “You say eether and I say eye-ther” and “You say neether and I say ny-ther”) are merely fragmented in the shorter third and fourth items (i.e., “Eether, eyether” and “Neether, nyther”). The fragmentation builds no less strongly toward a climactic reveal than new list items would do, and is apt in this particular lyric, since it adds to the argumentative quality. 28. Philip Furia (1996, 142–44) describes the compositional process of this particular song in some detail, noting the highly interactive dialogue between the two brothers. George’s musical ideas normally came first, at least as fragments, but then he responded to Ira’s lyrical interjections to create what Furia describes as “a perfect balance of syntactic and musical phrasing born of the mutuality of the brothers’ newfound method of collaboration.” I elaborate on this balance here. 29. In this genre, the sentence seems to be so prevalent as to make the presence or absence of end-rhyme between the two lyrical basic ideas of incidental concern, a helpful sonic link when it exists but certainly not a necessary condition for sentential treatment. 30. Thus, the presentation is essentially Caplin’s “statement-response” in reverse, moving dominant-to-tonic and then tonic-to-dominant rather than the other way around. The full-measure anacrusis on “The way you wear your” permits this unusual harmonic underlay without displacing tonic from the first beat of the hypermeasure (i.e., “hat”). 31. Malin (2010, 15–27) establishes declamatory schemas as frameworks for examining how poetic lines and couplets interact with musical meters in the German Lied. His notation, which I borrow here, shows each poetic line within brackets; each bar line with a slash; each accented syllable with either a beat number or, if it falls between beats, the letter ‘a’; and each beat lacking an accented syllable with a dash. 32. One could argue that Kern’s lyric actually contains three rather than two list items: “Fish got to swim” (½ n), “birds got to fly” (½ n), and “I got to love one man till I die” (n). I prefer to hear the fish and birds as a lyrical equivalent of a compound basic idea (after Caplin 1998, 61–70), though, since they act in combination to establish a list item pertaining to the needs of animals, to be followed by a second item about the needs of the protagonist. Admittedly, the melodically parallel settings of these two list items smooth over a lyrical relationship that is actually more nuanced. 33. Krebs (2013) also mentions poems set sententially by Schumann that include “lists” of places or images. While he does not present the concept of a reveal, he does discuss a structure that is similar, at least in proportion, to that of SLT1c: two list items corresponding to two basic ideas, followed by an unbroken second half corresponding to a sentential continuation. 34. Forte (1995, 56) also notes a lovely musical connection in support of the lyrical correspondence of “love” (measure 3) and “lovin” (measure 6); the melodic G and C of the former, with C as a harmonic root (vi), reappear in a bluer color on the latter as G-flat and C-flat, with C-flat as a harmonic root. 35. 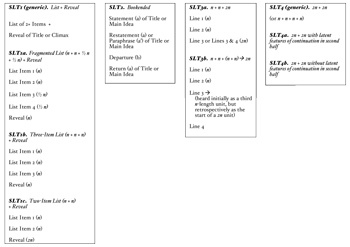 Some instances of the Two-Item List + Reveal (SLT1c) actually assist even further with the premature initiation of continuation function during the second n. The Gershwins’ “Someone to Watch Over Me” begins with an indivisible n-length list item (i.e., “There’s somebody I’m longing to see”), but the second item divides easily in half on account of rhyme and shared dactylic scansion: “I hope that he / turns out to be.” The music takes advantage of this ½ n + ½ n suggestion by setting each half of line 2 with the melodic motive from the second half of line 1, sequenced down by step each time. Thus, both lyrical and musical fragmentation have already added substantial momentum to the phrase by the time the cadential reveal even begins. 37. See Sondheim 2009, 63 and 212, for additional discussion of Porter’s “list songs,” by which is meant his list-only songs rather than the Lists + Reveals described by SLT1. Sondheim stakes the success of any list song on whether the examples are witty enough or have a cumulative effect. It seems plausible that wit and accumulation are obligatory surrogates for the climactic role that otherwise would be played by a reveal. 38. Alec Wilder (1972, 239) points out the unusual nature of the opening rhythm in this song, which consists of two pickups to the second measure rather than to the first; in fact, as he notes, the instrumental “fill-in” between the short vocal phrases becomes an essential part of the song. Aside from helping the lyric to be delivered as if the two characters were thinking up the praises in real time, this musical space also aids with the surface acceleration that takes place during the continuation. The musical space helps lines 1 and 2 to divide into the two separate “You’re the . . . ” clauses, but its absence in measures 10–11 provides rhythmic room for a larger number of syllables, and allows measures 9–12 to deliver line 3 of the lyric appropriately as a single unit. 39. Krebs (2013) discusses cases in which Schumann molds the second half of a poetic stanza (sometimes unnaturally) into a sentential continuation by denying, through musical declamation, the separation between lines of text. The effect is to prevent the poem from causing an atypical hiatus in the middle of the musical continuation. This is very similar to the musically rendered enjambment in measures 6–7 of the Lerner and Loewe phrase. 40. Sheila Davis describes two principal ways of locating the title or hook of a song to achieve payoff, which closely parallel the narrative trajectories described by the List + Reveal and Bookended types: “Most lyrics are linear; they develop from the given to the unknown and build to the payoff through the various ways just described [e.g., debate, conflict, turnaround, twist]. A circular lyric returns at its end to a significant word or line which has been used near the outset, thereby underscoring the theme by repeating it” (1985, 25). Several other writers also discuss title-first and title-last designs as the two most compelling layouts for lyrical stanzas; see Braheny 2006, 63; Citron 1991, 61; Forte 1995, 24; and Webb 1998, 40–41. 41. Kern’s music in “Ka-lu-a” is ironically ignorant of the semantic shift that I have described here. Lines 1, 2, and 5 each consist of exactly the same eight measures of music ending in an emphatic perfect authentic cadence, and lines 3 and 4 are accompanied by a sequential digression ending in a half cadence. The highly sectional nature of the music denies a hearing of one 32-bar sentence, so I do not discuss the music in detail here, but the dialogue between it and the far more sententially suggestive lyric invites interpretation. One might hear, for example, the unchanging nature of the place, “Kalua,” portrayed by the obstinately repetitive music, on top of which the lyrically expressed transformation takes place. 42. A lyric that combines aspects of SLTs 1 and 2 in yet another way is the Gershwins’ “I Got Rhythm,” which Ira himself elucidates (1973, 342–43). It begins with the title, which is suggestive of the Bookended type, but this title then morphs into three distinct list items: “I got rhythm,” “I got music,” and “I got my man.” The reveal is not the title, but the rhetorical refrain, “Who could ask for anything more?,” which concludes a lyric that turns out to be a better match to a Three-Item List + Reveal in spite of its titular opening. 43. The retrospective reinterpretation implied by the (n + n) → 2n notation suggests that a lyrical segment initially presenting itself as of length n becomes, in the sense of Janet Schmalfeldt’s (2011) “becoming arrow,” a segment of length 2n. Both Schmalfeldt and Caplin (1998) describe processes in which one function becomes another function (as in primary theme → transition) at some inexact musical location, as a result of a retrospective reassessment caused by what follows. Cases of poetic enjambment that cause reinterpretation are just slightly different because they rely on a dual linguistic potential at a specific moment, namely for the words that have sounded so far either to have meaning on their own or to be just the start of a longer phrase that means something more or different. For a discussion of this type of enjambment in the poems of German Lieder, see Malin (2010, 12). 44. Relatively few of Ira Gershwin’s lyrics exclude the title from their first lines. I suspect that this accounts for the prevalence of this hybrid type in his work, as it allows a way to capitalize on the uniquely forward-driven trajectory of the List + Reveal without dispensing altogether with the presence of a titular motto in lines 1 and 2. 45. We should keep in mind, however, that these superficial resemblances are to a specific kind of sentence with AABA design. The final return of opening melodic material rounds off this sentential sub-type in a way that is markedly different from sentences with continuations that develop, or contrast with, the material of the basic ideas. 46. See especially pages 107–10 in Rothstein 2007. The general traits of a quatrain that I list subsequently are normative, not prescriptive, as Rothstein demonstrates. 47. See Jenness and Velsey 2006, 10–11, for an interesting discussion of longer-range lyrical trajectories in American popular songs from the second half of the twentieth century. They say that the title or “hook” of a lyric nearly always occurs either in the first section or in the last: “If the former, the writer arranges matters so that the rest of the lyric elaborates, in a nonpredictable way, the basic trope. If the latter, the lyricist contrives to make the listener wait for the end to ‘get the point.’” While these two options sound like the Bookended and List + Reveal types, respectively, the authors are talking about lyrical form on the scale of entire songs rather than individual phrases. There is, of course, often a level of lyrical development that extends beyond the confines of a musical phrase, but I have limited discussion of this scale to song-sized lyrical designs that are convincingly sentential in nature. 48. This lyric is not an archetypal representative of the lyric-type, however. Even though a reveal need not be titular, the climactic status of this particular reveal is attenuated by the three iterations of the title earlier in the lyric. Moreover, the enjambment of the third list item with the reveal forces the latter simultaneously to finish the description of the third list item (about whispering) and to contextualize all three list items within the longing of the protagonist. This enjambment is suggestive of SLT3b, or n + n + (n + n) → 2n, although the status of line 4 as a reveal is strengthened somewhat by its brevity (6 syllables rather than 8–9 as before, and that long due only to the stutter on “close”). 49. The 36-measure sentence in “I Have Dreamed” is a close match to what Mark Richards calls a “trifold sentence.” Richards (2011, 195) carefully distinguishes three true basic ideas from two true basic ideas plus a continuation that begins as, but does not fully realize, a third one (i.e., what BaileyShea  calls a sentence with dissolving third statement). Measures 17–24 of “I Have Dreamed” are no more continuational than measures 9–16, nor does the third two-line list item (“How you look”) push toward the final reveal any more strongly than the second one (“I have dreamed ev’ry word”). It seems to me that a sentence of this inflated length can afford three true, presentational basic ideas because plenty of music (i.e., 12 measures) remains after them in which to add momentum and reach a cadence. In contrast, at least in this repertoire, the third list item of an 8-measure sentence virtually always initiates continuation, even if it is melodically similar to the first two. It must begin the process of adding momentum, it seems, because the two measures allocated to the lyrical reveal do not provide enough time to do this from scratch and still reach a cadence. 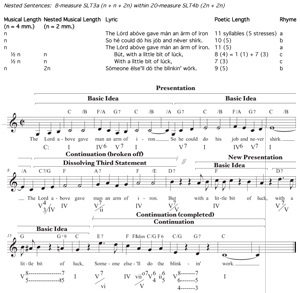 For overviews of the 32-measure popular song form, see Forte 2001, 17–20; Covach 2005, 69–70; Covach 2010; Everett 2009, 143; and Starr and Waterman 2010, 66–85. Forte (1993) and Starr and Waterman list both AABA and ABAC as standard 32-measure forms in the repertoire, which are called “popular song form” and “show tune form” in Citron 1991, 55–58. For this repertoire, I prefer “phrase-type” over “theme-type,” the term adopted by William Caplin (1998). “Theme” is not as good a fit to songs of the Great American Songbook as it is to Classical instrumental works, simply because the former are usually too short to permit the kind of longer-range thematic development essential in the latter. Throughout the article, “lyrical” will mean “pertaining to lyrics” (rather than cantabile), thereby distinguishing elements of phrase that derive from words from those that derive from music. Agreeing with Stephen Rodgers (forthcoming), I consider the entire sentence a single phrase, rather than conceiving of a presentation phrase and a continuation phrase as Caplin does (1998, 35–45). As Caplin acknowledges (page 45), the only true cadence comes at the end of the sentence, rather than at the end of the presentation. Likewise, the lyrics that I discuss are complete thoughts only when taken as wholes. I use Caplin’s (1998) terms, “presentation,” “basic idea,” and “continuation,” throughout. These are bracketed above the score and frequently include anacruses in order to align with complete lyrical units (e.g., “I have no will”). Agreeing with Mark Richards (2011) and Matthew BaileyShea (2004), I do not require the presentation to be tonic-prolongational. My specification of at least two basic ideas agrees with Harald Krebs’s definition (2013), and excludes what Richards has called ‘monofold’ sentences, which contain just a single basic idea. I consider the repetition of a basic idea an indispensable component of both musical and musico-poetic sentences, as it establishes a proportion against which the continuation can build momentum. This definition of continuation is only subtly different from the one formulated by Harald Krebs (2013) and adopted by Stephen Rodgers (forthcoming), which requires a continuation to be more active and unstable than the presentation; and from Mark Richards’s (2011), which requires acceleration of some sort (e.g., in harmonic rhythm, surface rhythm, or length of motivic units). Even in the absence of acceleration or increased activity, continuation can be brought about by an indivisible second half of the phrase that, on account of a single tonal progression or melodic grouping, does not breathe halfway through as the presentation does. For further discussion of how both poetic structure and poetic content can create a sentential presentation, see both Rodgers forthcoming, and Krebs 2013. These n-based designators show the musical lengths of lyrical segments; thus, ½ n means one measure here. By referring to the length of a lyrical line as a multiple of n, I do not mean to specify an exact number of syllables or of poetic feet that is held constant for each n within the lyric. This is because poetic structure and the amount of music occupied by a given number of syllables are often inconsistent within individual songs. The number of syllables or stresses in an n-length lyrical segment may be, but often is not, exactly double that in a ½ n-length lyrical segment. My likening of this last line of the lyric to a musical cadence is assisted by Caplin’s sensitive problematization of the term “cadence.” Distinguishing the moment of cadential arrival from the span occupied by cadential function (which includes the entire progression leading up to the arrival), he states: “Thus, the initial harmony of the progression marks the beginning of cadential material (be it a short idea or a full phrase), and the onset of the final harmony articulates the point of cadential arrival” (1998, 43). The notion of cadential progression is particularly important to a lyrical understanding of closure, since it is seldom possible to point to a particular word or exact moment that brings closure to a lyric. Rather, it is an entire clause or sentence that, as a syntactically interdependent unit akin to a cadential progression, offers conclusion. For fuller discussions of this distinction, see Braheny 2006, 42–44; Forte 2001, 23–24; Forte 1995, 28; Hammerstein 1985, 4; James T. Maher (in Wilder 1972, xxvi); Pattison 2012; and Sondheim 2009, xvii. The distinction is also implicit in Philip Furia’s (1996) account of Ira Gershwin, and in manuals for lyricists (e.g., Davis 1985, Webb 1998). This is not always the case, however, particularly when poems were intended from the start to be set by music, or even composed with particular musical rhythms in mind; see Malin 2010, 4. Forte’s playful term “pitch painting” (1995, 28) relies on a view of lyrics as aptly “setting” already written music rather than the reverse. In addition to historical accounts, there are several specific discussions by the lyricists themselves. Sondheim (2009, 43–44), for example, reports on West Side Story, for which Bernstein’s music almost invariably came first. Oscar Hammerstein writes that, prior to his collaboration with Richard Rodgers, he always wrote words to existing music. He also describes the variability of the process: “There is, as a matter of fact, no invariable or inevitable method for writing songs. Sometimes the words are written first, sometimes the music. Sometimes two or more collaborators lock themselves in a room and write words and music at the same time. The kind of songs, the individuals involved and the conditions under which they work dictate the process” (1985, 4). This conception of phrase resonates with Robin Attas’s (2010) definition for popular music, which requires a goal-directed motion and a conclusion effected through not only harmony, rhythm, and melodic contour, but text as well. Several factors can contribute to lyrical closure, including both sonic ones (e.g., completion of a rhyme scheme) and semantic ones. Forte’s surveys (1995 and 2001) are the most wide-ranging accounts of word-music interactions across this genre, and he frequently links musical characteristics including form to lyrical ones. He does mention the bar form in reference to some particular songs, although not as a principal means of musical or lyrical organization throughout the repertoire. There are, of course, many exceptions to these songwriting collaborations outside the corpus. Far from trying to be comprehensive of the genre, I have limited the list to five composers so that several of each one’s songs can be discussed. The work of Harold Arlen, Irving Berlin, Frank Loesser, Jerry Herman, Jule Styne, and many others belongs just as essentially to the same tradition, and their songs often display very similar sentential designs to those treated in detail here. 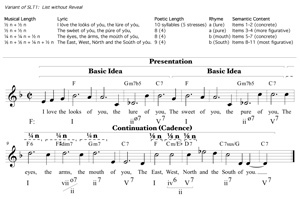 “Sectional verse” and “sectional refrain” are Covach’s (2005, 70) helpful terms for distinguishing the meanings above (i.e., the introductory and main sections of a popular song) from the different meanings that “verse” and “refrain” typically have with regard to pop music. This sentential taxonomy contrasts with topically organized schemes such as Ira Gershwin’s in Lyrics on Several Occasions (1973). Gershwin groups his own lyrics according to sentiment: “The Not Impossible He,” “Divers Duets,” “The Importunate Male,” etc. My taxonomy is intentionally unspecific with regard to what the lyrics are about, focusing instead on the proportions and trajectories that link with sentential qualities of the music. Notable exceptions include Caplin’s (1998) distinction between exact, sequential, and statement-response types of repetition in the presentation, which Stephen Rodgers (forthcoming) correlates with emotional states in Schubert’s Die schöne Müllerin, and Mark Richards’s (2011) categorization of sentences by their number of basic ideas (i.e., monofold, bifold, and trifold). When the reveal is titular, it acquires a dually climactic status since, as Forte notes (1995, 30), it is usually the title and its melody that come first or most easily to mind when we recall a tune from this genre. This is not meant to say that these lyrical sub-types are always paired with the corresponding musical type (although this may be the most natural word-music fit), but rather that they do lyrically something similar to what the corresponding musical type does musically. Jimmy Webb devotes a substantial discussion to the importance of placing the lyric’s title or principal idea in an appropriate spot. “To elaborate,” he instructs, “the writer will want to work hard to set up a situation or relationship in the main body of the song that will cause the trite title to land with unexpected force...” (1998, 44). The point is an important one: the reveal is often known well in advance, particularly if it is the title, but the accrual of tension or interest in the preceding lines can elevate the status of the reveal to that of a lyrical cadence. Everett’s (2009) SRDC model is appropriated by Jay Summach (2011) to analyze sentences in pop songs. The distinct functions of Statement/Restatement, Departure, and Conclusion serve as useful references against which to describe alterations and expansions of the sentence into the larger and more independent modules of Verse, Pre-Chorus, and Chorus, respectively. Nobile (2011) discusses the connection between the SRDC model and Beatles lyrics, noting how a textual idea is stated, restated, continued, and concluded. SLT2 is more precise about the nature of this lyrical conclusion, requiring a reprise of the initial statement rather than an introduction of new material at the end. Trevor de Clercq (2012, 154–55) draws a helpful distinction between the sentence and the SRDC, noting the possibility of a fused continuation/cadential function in the former as a main difference. This accounts for why the SRDC is a good fit for many Bookended lyrics, but is less well suited to sentences in which the continuation is not best described as a departure from the presentation (e.g., SLT1a, SLT1b) or as a separate function from the cadence (e.g., SLT3). The musico-poetic analogy is inexact, however. In the Beethoven, we can point to a specific climactic moment (i.e., the C6 in measure 7) where the intensification of the preceding material culminates, and thereafter dissipates through the descending melodic sixth and the half cadence. Linguistic syntax often constrains a lyrical reveal to play both roles, climax and cadence, simultaneously and indistinguishably. For Krebs (2013), the stability and sense of rounding-off secured by the terminal return of the basic idea are enough to exclude these AABA phrases as altogether separate from sentences. Like Rodgers (forthcoming) and BaileyShea (2004), I do count them as sentences due to the gain in momentum that is still possible during the phrase’s third quarter. Another common lyrical strategy is to set the scene in the two n-length items, and then to take action in the two ½ n-length items in order to motivate the reveal. Lines 1–2 of Lerner and Loewe’s “Get Me to the Church On Time” introduce the impending marriage of Alfred Doolittle and lines 3–4 signal his decision to imbibe on the eve before; the reveal synthesizes the two, commanding his pals to get him, regardless of what state he is in, to the church. It is also possible for a list to include redundant items. The first two list items of “Let’s Call the Whole Thing Off” by the Gershwins (i.e., “You say eether and I say eye-ther” and “You say neether and I say ny-ther”) are merely fragmented in the shorter third and fourth items (i.e., “Eether, eyether” and “Neether, nyther”). The fragmentation builds no less strongly toward a climactic reveal than new list items would do, and is apt in this particular lyric, since it adds to the argumentative quality. Philip Furia (1996, 142–44) describes the compositional process of this particular song in some detail, noting the highly interactive dialogue between the two brothers. George’s musical ideas normally came first, at least as fragments, but then he responded to Ira’s lyrical interjections to create what Furia describes as “a perfect balance of syntactic and musical phrasing born of the mutuality of the brothers’ newfound method of collaboration.” I elaborate on this balance here. In this genre, the sentence seems to be so prevalent as to make the presence or absence of end-rhyme between the two lyrical basic ideas of incidental concern, a helpful sonic link when it exists but certainly not a necessary condition for sentential treatment. Thus, the presentation is essentially Caplin’s “statement-response” in reverse, moving dominant-to-tonic and then tonic-to-dominant rather than the other way around. The full-measure anacrusis on “The way you wear your” permits this unusual harmonic underlay without displacing tonic from the first beat of the hypermeasure (i.e., “hat”). Malin (2010, 15–27) establishes declamatory schemas as frameworks for examining how poetic lines and couplets interact with musical meters in the German Lied. His notation, which I borrow here, shows each poetic line within brackets; each bar line with a slash; each accented syllable with either a beat number or, if it falls between beats, the letter ‘a’; and each beat lacking an accented syllable with a dash. One could argue that Kern’s lyric actually contains three rather than two list items: “Fish got to swim” (½ n), “birds got to fly” (½ n), and “I got to love one man till I die” (n). I prefer to hear the fish and birds as a lyrical equivalent of a compound basic idea (after Caplin 1998, 61–70), though, since they act in combination to establish a list item pertaining to the needs of animals, to be followed by a second item about the needs of the protagonist. Admittedly, the melodically parallel settings of these two list items smooth over a lyrical relationship that is actually more nuanced. Krebs (2013) also mentions poems set sententially by Schumann that include “lists” of places or images. While he does not present the concept of a reveal, he does discuss a structure that is similar, at least in proportion, to that of SLT1c: two list items corresponding to two basic ideas, followed by an unbroken second half corresponding to a sentential continuation. Forte (1995, 56) also notes a lovely musical connection in support of the lyrical correspondence of “love” (measure 3) and “lovin” (measure 6); the melodic G and C of the former, with C as a harmonic root (vi), reappear in a bluer color on the latter as G-flat and C-flat, with C-flat as a harmonic root. 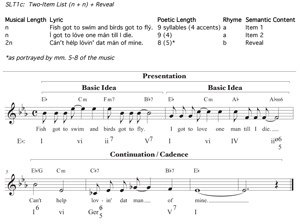 Some instances of the Two-Item List + Reveal (SLT1c) actually assist even further with the premature initiation of continuation function during the second n. The Gershwins’ “Someone to Watch Over Me” begins with an indivisible n-length list item (i.e., “There’s somebody I’m longing to see”), but the second item divides easily in half on account of rhyme and shared dactylic scansion: “I hope that he / turns out to be.” The music takes advantage of this ½ n + ½ n suggestion by setting each half of line 2 with the melodic motive from the second half of line 1, sequenced down by step each time. Thus, both lyrical and musical fragmentation have already added substantial momentum to the phrase by the time the cadential reveal even begins. See Sondheim 2009, 63 and 212, for additional discussion of Porter’s “list songs,” by which is meant his list-only songs rather than the Lists + Reveals described by SLT1. Sondheim stakes the success of any list song on whether the examples are witty enough or have a cumulative effect. It seems plausible that wit and accumulation are obligatory surrogates for the climactic role that otherwise would be played by a reveal. Alec Wilder (1972, 239) points out the unusual nature of the opening rhythm in this song, which consists of two pickups to the second measure rather than to the first; in fact, as he notes, the instrumental “fill-in” between the short vocal phrases becomes an essential part of the song. Aside from helping the lyric to be delivered as if the two characters were thinking up the praises in real time, this musical space also aids with the surface acceleration that takes place during the continuation. The musical space helps lines 1 and 2 to divide into the two separate “You’re the . . . ” clauses, but its absence in measures 10–11 provides rhythmic room for a larger number of syllables, and allows measures 9–12 to deliver line 3 of the lyric appropriately as a single unit. Krebs (2013) discusses cases in which Schumann molds the second half of a poetic stanza (sometimes unnaturally) into a sentential continuation by denying, through musical declamation, the separation between lines of text. The effect is to prevent the poem from causing an atypical hiatus in the middle of the musical continuation. This is very similar to the musically rendered enjambment in measures 6–7 of the Lerner and Loewe phrase. Sheila Davis describes two principal ways of locating the title or hook of a song to achieve payoff, which closely parallel the narrative trajectories described by the List + Reveal and Bookended types: “Most lyrics are linear; they develop from the given to the unknown and build to the payoff through the various ways just described [e.g., debate, conflict, turnaround, twist]. A circular lyric returns at its end to a significant word or line which has been used near the outset, thereby underscoring the theme by repeating it” (1985, 25). Several other writers also discuss title-first and title-last designs as the two most compelling layouts for lyrical stanzas; see Braheny 2006, 63; Citron 1991, 61; Forte 1995, 24; and Webb 1998, 40–41. Kern’s music in “Ka-lu-a” is ironically ignorant of the semantic shift that I have described here. Lines 1, 2, and 5 each consist of exactly the same eight measures of music ending in an emphatic perfect authentic cadence, and lines 3 and 4 are accompanied by a sequential digression ending in a half cadence. The highly sectional nature of the music denies a hearing of one 32-bar sentence, so I do not discuss the music in detail here, but the dialogue between it and the far more sententially suggestive lyric invites interpretation. One might hear, for example, the unchanging nature of the place, “Kalua,” portrayed by the obstinately repetitive music, on top of which the lyrically expressed transformation takes place. A lyric that combines aspects of SLTs 1 and 2 in yet another way is the Gershwins’ “I Got Rhythm,” which Ira himself elucidates (1973, 342–43). It begins with the title, which is suggestive of the Bookended type, but this title then morphs into three distinct list items: “I got rhythm,” “I got music,” and “I got my man.” The reveal is not the title, but the rhetorical refrain, “Who could ask for anything more?,” which concludes a lyric that turns out to be a better match to a Three-Item List + Reveal in spite of its titular opening. The retrospective reinterpretation implied by the (n + n) → 2n notation suggests that a lyrical segment initially presenting itself as of length n becomes, in the sense of Janet Schmalfeldt’s (2011) “becoming arrow,” a segment of length 2n. Both Schmalfeldt and Caplin (1998) describe processes in which one function becomes another function (as in primary theme → transition) at some inexact musical location, as a result of a retrospective reassessment caused by what follows. Cases of poetic enjambment that cause reinterpretation are just slightly different because they rely on a dual linguistic potential at a specific moment, namely for the words that have sounded so far either to have meaning on their own or to be just the start of a longer phrase that means something more or different. For a discussion of this type of enjambment in the poems of German Lieder, see Malin (2010, 12). Relatively few of Ira Gershwin’s lyrics exclude the title from their first lines. I suspect that this accounts for the prevalence of this hybrid type in his work, as it allows a way to capitalize on the uniquely forward-driven trajectory of the List + Reveal without dispensing altogether with the presence of a titular motto in lines 1 and 2. We should keep in mind, however, that these superficial resemblances are to a specific kind of sentence with AABA design. The final return of opening melodic material rounds off this sentential sub-type in a way that is markedly different from sentences with continuations that develop, or contrast with, the material of the basic ideas. See especially pages 107–10 in Rothstein 2007. The general traits of a quatrain that I list subsequently are normative, not prescriptive, as Rothstein demonstrates. See Jenness and Velsey 2006, 10–11, for an interesting discussion of longer-range lyrical trajectories in American popular songs from the second half of the twentieth century. They say that the title or “hook” of a lyric nearly always occurs either in the first section or in the last: “If the former, the writer arranges matters so that the rest of the lyric elaborates, in a nonpredictable way, the basic trope. If the latter, the lyricist contrives to make the listener wait for the end to ‘get the point.’” While these two options sound like the Bookended and List + Reveal types, respectively, the authors are talking about lyrical form on the scale of entire songs rather than individual phrases. There is, of course, often a level of lyrical development that extends beyond the confines of a musical phrase, but I have limited discussion of this scale to song-sized lyrical designs that are convincingly sentential in nature. This lyric is not an archetypal representative of the lyric-type, however. Even though a reveal need not be titular, the climactic status of this particular reveal is attenuated by the three iterations of the title earlier in the lyric. Moreover, the enjambment of the third list item with the reveal forces the latter simultaneously to finish the description of the third list item (about whispering) and to contextualize all three list items within the longing of the protagonist. This enjambment is suggestive of SLT3b, or n + n + (n + n) → 2n, although the status of line 4 as a reveal is strengthened somewhat by its brevity (6 syllables rather than 8–9 as before, and that long due only to the stutter on “close”). 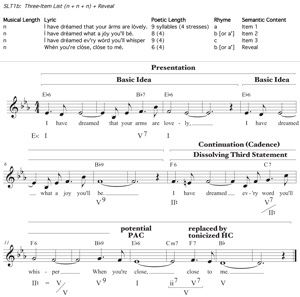 The 36-measure sentence in “I Have Dreamed” is a close match to what Mark Richards calls a “trifold sentence.” Richards (2011, 195) carefully distinguishes three true basic ideas from two true basic ideas plus a continuation that begins as, but does not fully realize, a third one (i.e., what BaileyShea  calls a sentence with dissolving third statement). Measures 17–24 of “I Have Dreamed” are no more continuational than measures 9–16, nor does the third two-line list item (“How you look”) push toward the final reveal any more strongly than the second one (“I have dreamed ev’ry word”). It seems to me that a sentence of this inflated length can afford three true, presentational basic ideas because plenty of music (i.e., 12 measures) remains after them in which to add momentum and reach a cadence. In contrast, at least in this repertoire, the third list item of an 8-measure sentence virtually always initiates continuation, even if it is melodically similar to the first two. It must begin the process of adding momentum, it seems, because the two measures allocated to the lyrical reveal do not provide enough time to do this from scratch and still reach a cadence.